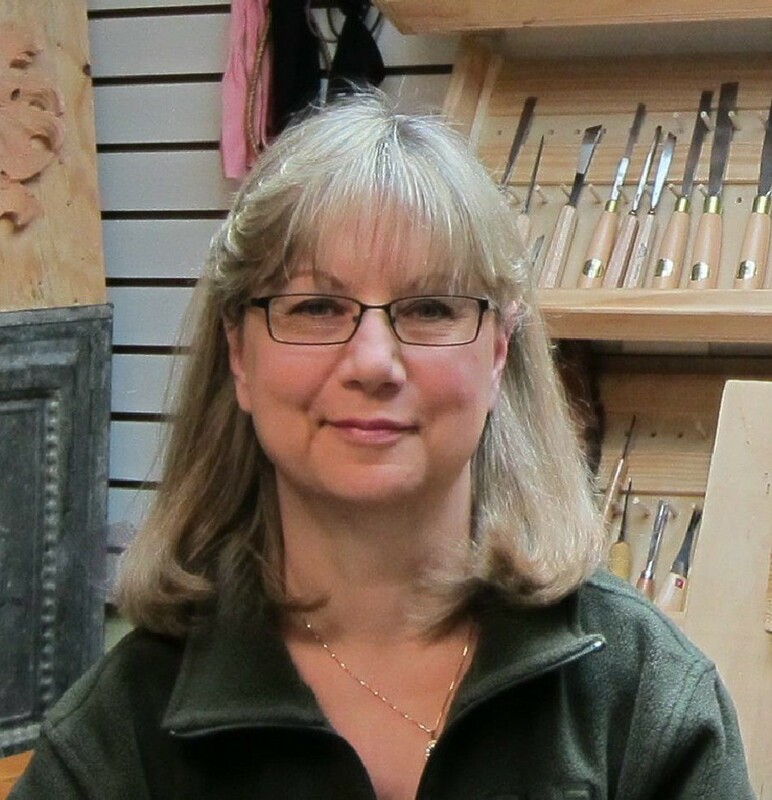 Susan Alexander and Let’s Talk Carving Are On Hiatus! Hel­lo every­one! Susan Alexan­der is tak­ing a few months away from writ­ing Let’s Talk Carv­ing. We expect her and Let’s Talk Carv­ing to return in the new year. We’ll let you know as soon as a return date is con­firmed. Until then, you may con­tin­ue to sub­mit ques­tions and com­ments using the form below (but please don’t expect an answer right away). The Most Funnest* Carving Competition Ever! Please refer to and fol­low all man­u­fac­tur­ers’ direc­tions. Safe­ty First! Enter­ing a carv­ing com­pe­ti­tion usu­al­ly involves a whole lot more than carv­ing a com­pe­ti­tion-wor­thy piece. What type of wood should you use? Do you have the right size at home, or do you have to go out and buy wood? Is the com­pe­ti­tion close enough so you can deliv­er your carv­ing, or do you have to search for the cor­rect size box, gath­er pack­ing mate­r­i­al, pack it up, add postage, mail it, pray it gets there safe­ly and then there is the cost and pack­ing of the carving’s return trip home. All this takes time, and you haven’t even start­ed the funnest* part yet – carv­ing! I cer­tain­ly am not try­ing to dis­suade you from enter­ing any/all carv­ing com­pe­ti­tions; go for it, espe­cial­ly the 50th Inter­na­tion­al Wood­carvers Con­gress in 2016, as well as your local carv­ing club com­pe­ti­tions. I am here to offer you the oppor­tu­ni­ty of hav­ing some plain, old-fash­ioned, sit­tin’ on the back porch while the autumn leaves fall, carv­ing FUN in the next few weeks! I’m speak­ing of the third annu­al Helvie Knives’ Han­dle Carv­ing Com­pe­ti­tion, run by Rich and Hol­li Smith­son, own­ers of Helvie Knives. This carv­ing com­pe­ti­tion offers all of the fun and none of the has­sle. 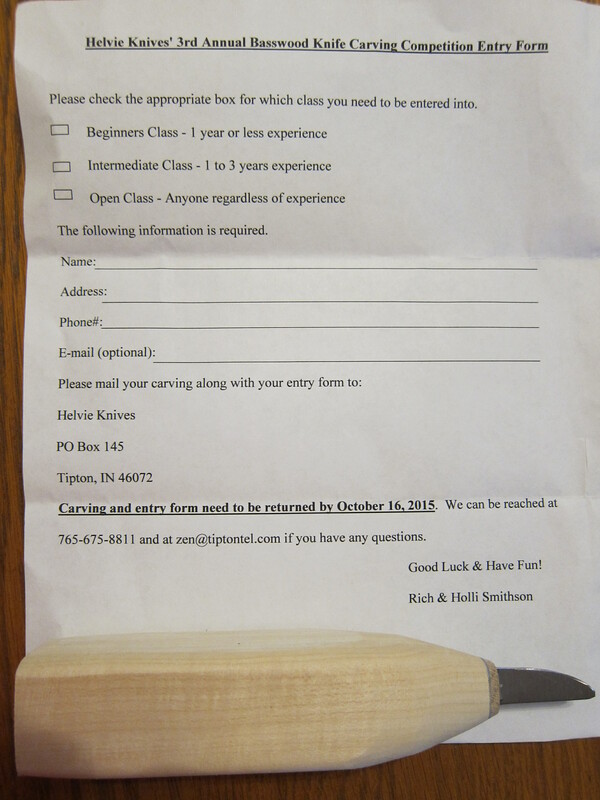 For $5, which includes your entry fee, Rich/Holli (prob­a­bly Hol­li) will send you exact­ly what you see in the pho­to below – an unsharp­ened dum­my knife with a 6 inch bass­wood han­dle and an entry form. 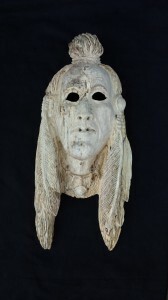 If your carv­ing turns out spec­tac­u­lar­ly well, and you want it returned in lieu of allow­ing it to join the 170 oth­er carved knife han­dles dis­played at Helvie’s head­quar­ters, then send an addi­tion­al $5 when you mail off your carved knife han­dle and they’ll send it back to you after the com­pe­ti­tion. Of course, there are a few rules. This is the third year of the com­pe­ti­tion, and the rules have been firmed up a bit because carvers are such a cre­ative bunch. Basi­cal­ly, it’s just “carve the han­dle with­out cut­ting it apart or glu­ing any add-ons to it, and leave the blade alone.” Not sure what exact­ly is allowed? Go to www.Helvieknives.com web­site and read the rules. I asked Hol­li to send me a few pho­tos of knife han­dle carv­ings from past years so you can have an idea of what types of carv­ings have been done in the past….looks like every­thing from A to Z! You are on your hon­or to enter the cor­rect class. 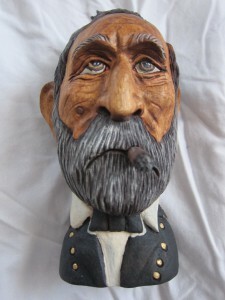 Carvers are an hon­est group of peo­ple main­ly because it is a small com­mu­ni­ty and we would all know if you fibbed. Now, this is the impor­tant part. To get your atten­tion, I am putting this in bold and red, typ­ing it in cap­i­tal let­ters, and cen­ter­ing the lines. It takes a few days for the post office to deliv­er your check to Helvie, and then anoth­er few days to receive your blank. Turn around time for me was less than a week. If, in the next day or two, you put a check in the mail to them, by the time you receive your blank, you should have a good two weeks to carve and fin­ish you knife han­dle and get it back to Helvie by Octo­ber 16. That is more than enough time for you to turn out a com­pe­ti­tion-wor­thy 6” carv­ing. Sounds like a ter­rif­ic carv­ing club project to me. That cinched it! I sent Helvie a $15 check, less than the cost of a deliv­ered piz­za. For that I received two blanks ($5 each) and guar­an­teed return ship­ping ($5). My $15 invest­ment, even if I don’t win a prize (great prizes, by the way – see below), is well worth hav­ing two real­ly cool but­ter knives. Got ques­tions about the com­pe­ti­tion that I haven’t answered? Call Hol­li Smith­son at Helvie Knives at 765–675-8811, or email her at zen@tiptontel.com. 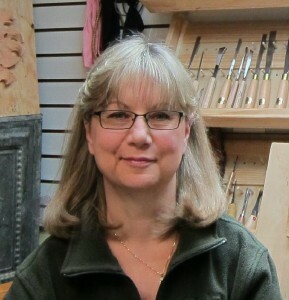 You can also check out www.helvieknives.com for addi­tion­al infor­ma­tion. If you send me pho­tos of your Helvie carved knife han­dles, I’ll run them, with your name, in the Novem­ber issue. It would be great to see everyone’s carv­ings. You can send your pho­tos to SusanAlexanderCarvesOnWOM@comcast.net. Helvie will take all carv­ing entries to the Rene­gade Roundup in Ten­nessee to be judged by CCA mem­ber, Steve Brown. Par­tic­i­pants do not need to be in atten­dance to win. Win­ners will be noti­fied either by phone or email – your choice. Wait … there’s still more. Oth­er carvers and com­pa­nies are com­ing on board in sup­port of the Helvie Knife Han­dle Com­pe­ti­tion. Helvie has already received and will award two $25 gift cer­tifi­cates from Chip­ping Away, two rough­outs from Jim His­er, and a spe­cial carv­ing from Don Mertz, cur­rent sec­re­tary of Car­i­ca­ture Carvers of Amer­i­ca. Wait … there’s even more! Every first-place win­ner will receive a Helvie Knife of their choice. Click on the Helvie Knife logo in the col­umn to the right to go direct­ly to Helvie’s online store where you will see hun­dreds of knives made to the spec­i­fi­ca­tions of some of the finest carvers in the world, and avail­able to you. Over­whelmed with which knife is best suit­ed for your style of carv­ing and size of your hand, or have a spe­cif­ic need? No prob­lem! Speak with the own­er, Rich Smith­son, at 765–675-8811 and tell him I told you to call. He is accus­tomed to work­ing with carvers. After ask­ing you a few ques­tions, Rich will be able to give you his knife rec­om­men­da­tions. Talk about per­son­al ser­vice! Start­ing this month, Helvie Knives is one of our new spon­sors. Please wel­come Hol­li and Rich Smith­son to the Carvers Com­pan­ion and the Let’s Talk Carv­ing fam­i­ly. So … who is stand­ing over your shoul­der, whis­per­ing into your ear? Don’t turn around. You won’t see the line of carvers who have giv­en you the help and encour­age­ment that made you the carv­er you are today, but they are all behind you. Even if you can’t see them, slow down for a moment the next time you carve and you may very well feel them, and if you are like me, hear them, as well. At the last Inter­na­tion­al Wood­carvers Con­gress ban­quet, I sat with Neil Cox, Vic Hood and Ter­ry Brash­er. When I got home and start­ed a carv­ing, they came to mind. Think­ing about them, I felt bad­ly that I hadn’t told them how each had influ­enced my carv­ing edu­ca­tion. Every time I reach for a V-tool, I hear Neil’s gen­tle voice sug­gest­ing to start with a vein­er because it is eas­i­er to fix a mis­take made with a vein­er than a V-tool. 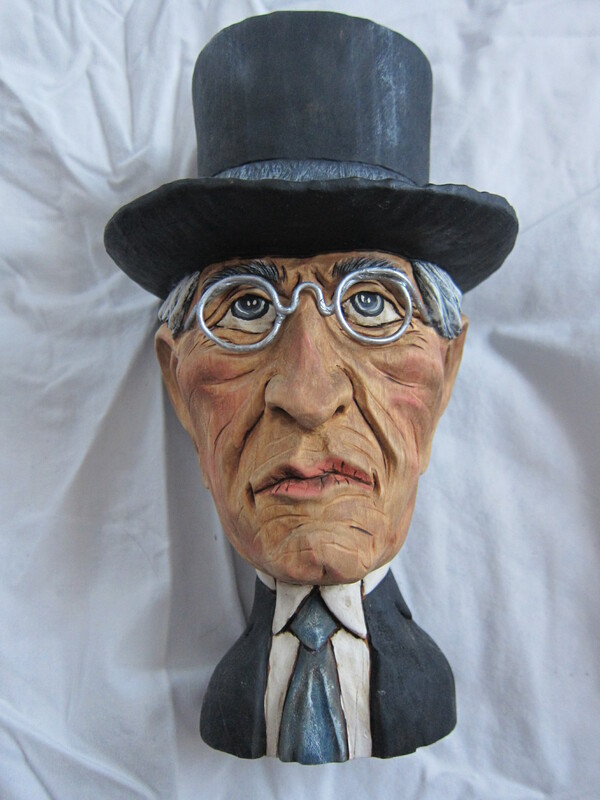 When­ev­er I believe the face I’ve carved is just about done, I hear Vic Hood telling me I could go “deep­er.” When I’m lay­ing out a face, Ter­ry Brash­er is remind­ing me to mea­sure my face by the size of the eyes so it will fit into the size wood I’ve cho­sen. Although I thought about it dur­ing the ban­quet, I nev­er told Neil, Vic or Ter­ry, “Thank You,” but I’m doing that right now. So, how about you? Who is stand­ing over your shoul­der? Do they know that they’ve helped you? Besides thank­ing them, we should be pass­ing along their nuggets of wis­dom. That’s what carv­ing and this col­umn is all about. While I was think­ing about adding this new fea­ture, it just hap­pened that, on the same day, I spoke with both Rick Jensen and Lar­ry Yud­is, so I asked them who they would thank, and why. You’ll see their respons­es below. I’ve already primed the pump, but here are two more peo­ple I want to thank, with more next month, because I’ve got a thou­sand of ‘em. Kei­th Miller, the first per­son who put a bench knife and a piece of bass­wood in my hands taught a Wednes­day night carv­ing class at The Cen­ter in Palos Park. Kei­th extolled the virtues of look­ing at a carv­ing not only right side up, but upside down, down from the top, up from the bot­tom, and from both sides. After I would do a “quick” scan of my carv­ing, hop­ing it would be “good enough”, he would take it from my hands and point out what this novice carv­er had over­looked. Yes, Kei­th, I remem­ber you say­ing, “It isn’t done until I say it’s done.” Thank you, my friend. If not for you, this won­der­ful carv­ing com­mu­ni­ty would not be a large part of my life. Rick Jensen, 2014 WCI Carv­er of the Year, reminds me (to this day) that it is vital to wear an apron with a front leather insert when pow­er carv­ing because a bit going at 40,000 RPM can grab your clothes and hurt you bad­ly. To dri­ve that point home, he has told me, in graph­ic detail, what he has seen an out-of-con­trol bit do to a carv­er. Before I even sit down to carve, I look at my pow­er carv­ing equip­ment, hear Rick’s words and reach for my leather apron. Rick Jensen: I always think of my good friend, Harold Enlow, every time I do a demon­stra­tion. 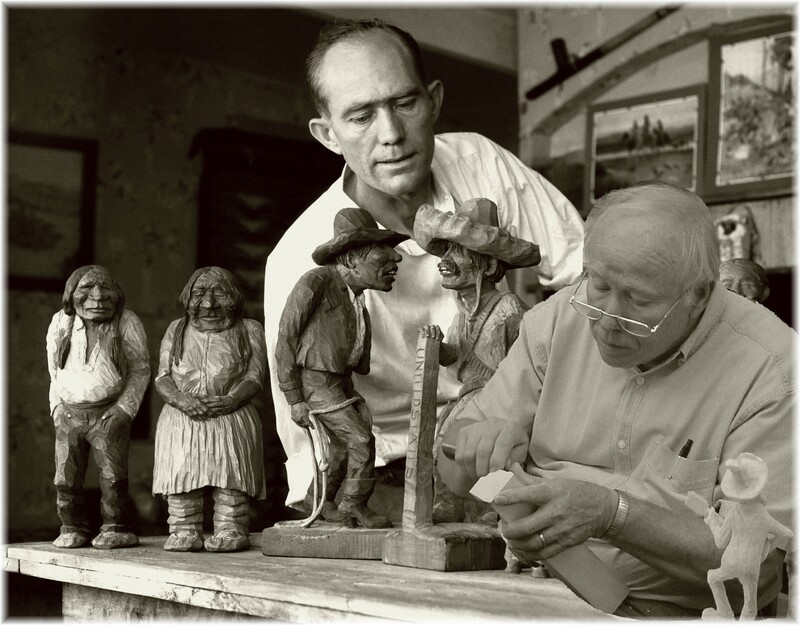 Harold taught me how to carve clean and how to impress peo­ple when I carve by using large tools to make big bold cuts. He also taught me how to hold an audience’s atten­tion while carv­ing by mak­ing these large dra­mat­ic cuts and telling jokes and sto­ries. Lar­ry Yud­is: I guess if I’d have to put into a few words how Harold Enlow influ­enced me it would be: Remem­ber, it’s just a piece of wood … and, some­times you have to impro­vise. That just showed me a per­son shouldn’t get all worked up if some­thing isn’t turn­ing out quite the way it was intend­ed. Change your pat­tern … change your plans … impro­vise! You must know what I need­ed to do after hear­ing Rick and Lar­ry thank Harold. I had to speak with Harold Enlow. Harold told me that, with­out a doubt, it would be H. S. ‘Andy’ Ander­son. Andy’s car­i­ca­ture carv­ing book influ­enced Harold’s entire life, which is accu­rate when you remem­ber that Harold Enlow is known as the God­fa­ther of Mod­ern Day Car­i­ca­ture Carv­ing, writ­ten numer­ous books with their accom­pa­ny­ing study sticks, is a tool mak­er, black­smith, and a found­ing mem­ber of CCA, the Car­i­ca­ture Carvers of Amer­i­ca. I won­dered if Harold and Andy had ever met. Harold said that although he was sta­tioned in Albu­querque, New Mex­i­co, while Andy was liv­ing in San­ta Fe, unfor­tu­nate­ly he had nev­er had the oppor­tu­ni­ty to meet Andy, and would prob­a­bly have been hes­i­tant to talk to such a famous carv­er. I told Harold now he knew how I felt talk­ing to him. So this part of our sto­ry almost comes to an end, except … just before we hung up, Harold men­tioned a pho­to that Don Arnett had manip­u­lat­ed a few years back … that includ­ed Harold and Andy. Of course, I couldn’t let that lie. I had to con­tact Don Arnett. You’ve already seen Don’s won­der­ful, heart-warm­ing pho­to at the begin­ning of this fea­ture. Thank you, Don, for allow­ing us to share it with our read­ers. So, my carv­ing friends, this is a bit like Ancestry.com, except a carvers’ ver­sion. It was Andy Anderson’s book that influ­enced Harold Enlow who influ­enced Rick Jensen, Lar­ry Yud­is and an entire world of carvers, and, in the end, it was Andy in Don Arnett’s pho­to that inspired the name of this new Let’s Talk Carv­ing fea­ture, You Are Nev­er Alone. I won­der who was look­ing over H. S. ‘Andy’ Anderson’s shoul­der. If you have a carv­er or instruc­tor you would like to thank, use the form below to send me their name, and in a few sen­tences what they specif­i­cal­ly taught you that improved your carv­ing skills and cre­ativ­i­ty. You can send me one or numer­ous “Thank You” mes­sages to be pub­lished, as space per­mits. They can either be for the same per­son or for dif­fer­ent peo­ple. In today’s world, we can’t have too many “thank you’s” float­ing around out there, plus what­ev­er it was that helped you be a bet­ter carv­er will now be read and help oth­er, new­er carvers. Until then, gen­tle read­er, may your wood be plen­ti­ful and your tools stay sharp. Take care, carve lots, and always remem­ber to smile. *Yes. I know there is no such word as “funnest.” I made it up. It’s one of the perks of writ­ing this col­umn. 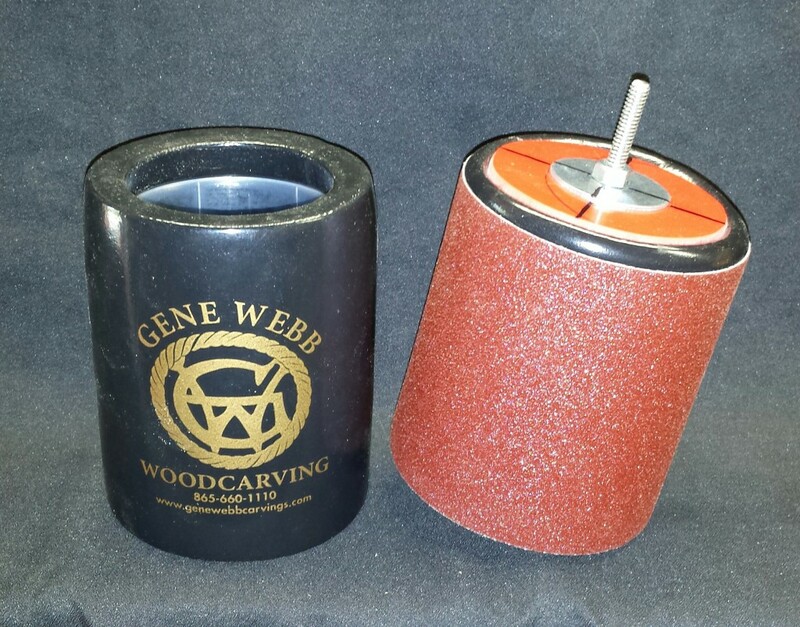 When Gene Webb told me he made a large sander out of his koozie, I had to ask him for direc­tions so I could share the infor­ma­tion with all of you and because while I don’t own a large sander, I do own a Gene Webb koozie. 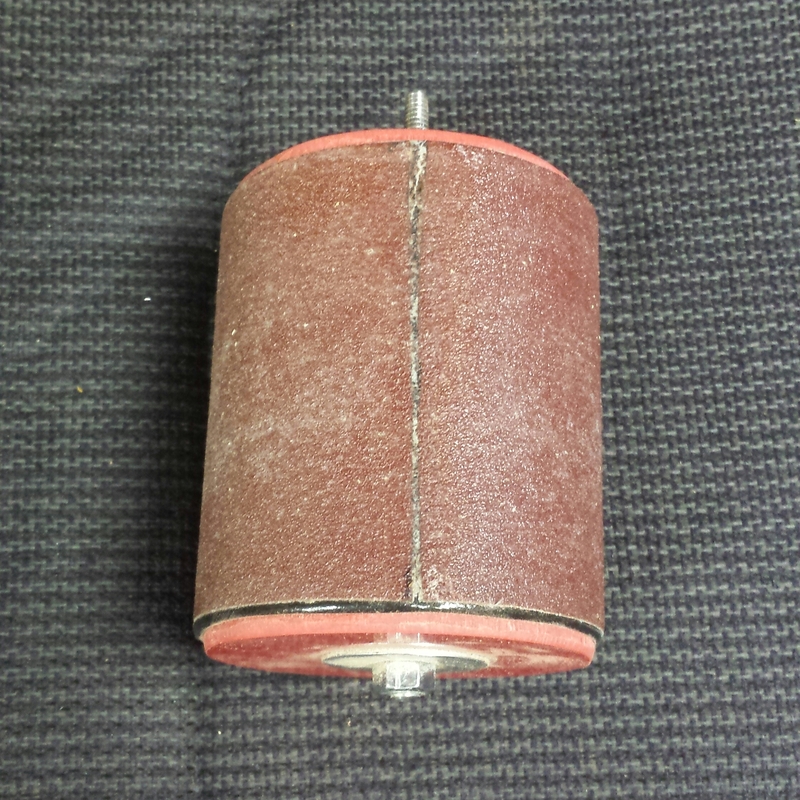 Here are Gene’s instruc­tions on how to make your own koozie sander. 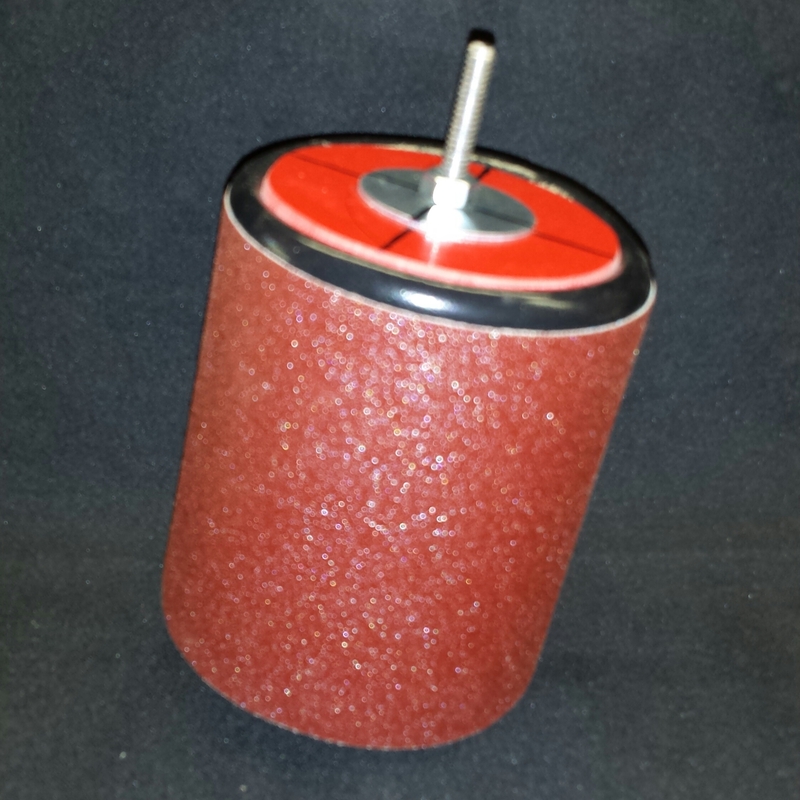 I wore my logo off my koozie, so I decid­ed to try and make a big sander that I could use in my drill. It works great and wasn’t too hard to make. My koozies have a plas­tic cup built inside it (not all koozies have that). The plas­tic cup makes it durable and is why I chose this type of koozie for my wood­carv­ing school and busi­ness. Now, I can use it as 3” by 4” sander that works pret­ty well in a drill. You have to run the drill slow­ly, with it being that big. All I did was cut out 2 end caps about 1/4 small­er in diam­e­ter than the koozie cup. I need­ed the end caps because when I tight­ened the all-thread bolt with­out them, it squeezed the koozie flat. The end caps help to hold the belt on, and to keep the cup’s shape. The belt took a while to fig­ure out. Final­ly, I used Goril­la tape on the back. Where the sand paper meets, the pres­sure slight­ly expands a small gap, but the Goril­la tape is still hold­ing strong. One 3/8″ all thread bolt with 2 wash­ers and 2 nuts. They can throw in their own cussing as they go. 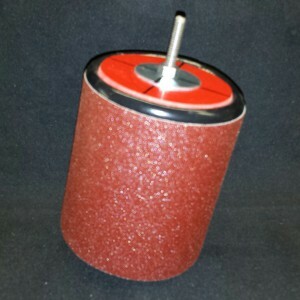 This koozie sander works great on sand­ing off the burs. 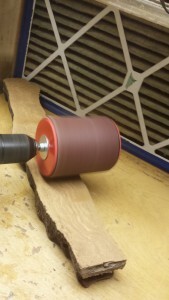 You could use the sander in the drill, or strap the drill down and just hold the wood to it. What­ev­er works best for you. Remem­ber – you will have to run the drill slow­ly, with it being that big, and because we don’t know how long the Goril­la Tape will hold, always work slow­ly, care­ful­ly, wear eye pro­tec­tion, and check your koozie sander before and after each use. If any­one has any ques­tions about the instruc­tions or the sander, they shouldn’t hes­i­tate to call me at: 865–660-1110. Thanks, Gene, for tak­ing the time to send us the instruc­tions and the pic­tures, and for spon­sor­ing the Carvers Com­pan­ion. Like I always say, Carvers help­ing Carvers! I received an email from Rick Houlden regard­ing an issue he is expe­ri­enc­ing when paint­ing his carv­ings, and then using a sealant. I dip my carv­ings and some­times I can see some col­or com­ing off onto the paper tow­el when remov­ing excess sealant. 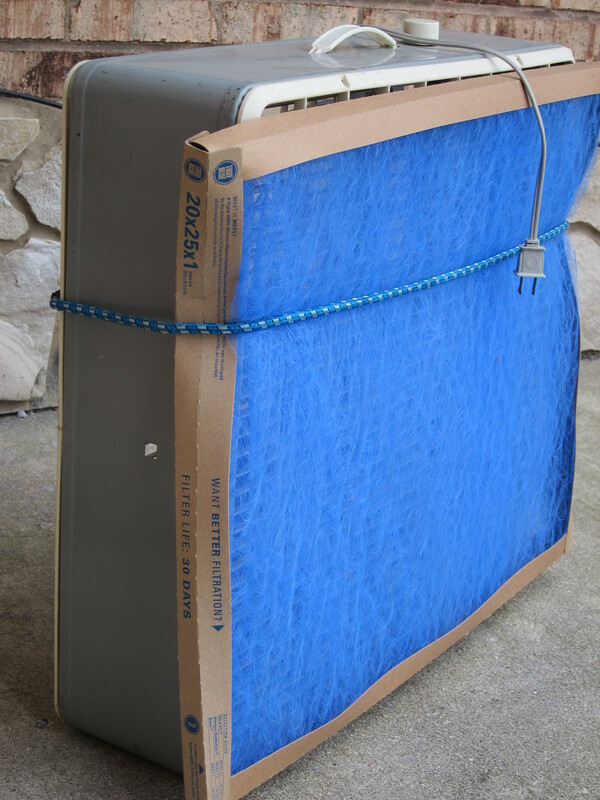 Since I work out of my garage that is attached to our home I have nev­er been inter­est­ed in using (can’t think of the name) the fin­ish that is known to be flam­ma­ble on the used rags. I found my cur­rent sys­tem in a carv­ing mag­a­zine, the carv­er not­ed that this sys­tem doesn’t leave flam­ma­ble rags around and also is more cost effec­tive. But it can have issues when apply­ing the sealant over acrylic paints when remov­ing excess sealant from the carv­ing. I used the Min­wax Poly­crylic in the clear satin fin­ish it is a water based sealant. I like many carvers lay­er my paints either by blend­ing the col­ors or as with the eyes paint a black dot then inside the black I paint the brown or blue in a small­er diam­e­ter then add a small white dot as the reflec­tive high­light. I have usu­al­ly after dip­ping give the carv­ing a minute or two to drip off the excess but at times need to take a tow­el or paper cloth to remove access sealant. If not care­ful with the way I han­dle the carv­ing at this point I can have small spots of col­or pull off. It doesn’t hap­pen all the time and I am slow­ly per­fect­ing the way I do this but it made me won­der what is if any the com­plete cur­ing time of the acrylic paints. Most seem to believe that is when it is dry to the touch but since in the past I have had some col­or come off this gives me the impres­sion that the lay­ered area may not have been com­plete­ly cured at the time of dip­ping. 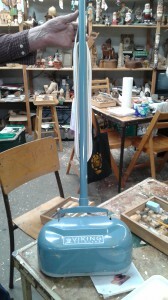 I have begun to put a sealant coat­ing on the carv­ings before I begin to paint but I know this is not the issue since I have had the col­or show­ing on the cloth even before I began this process. I know some carvers say to dip the carv­ing and then once the major­i­ty has drained place the carv­ing bot­tom down on a paper tow­el to allow more run off of the excess. But I many times let the col­or con­tin­ue to the back­side stop­ping at the point where the hol­low­ing of the carv­ing begins. If you have a sug­ges­tion for Rick, send it to SusanAlexanderCarves@comcast.net, or fill in the info below, with your com­ments, and it will get to me. I will for­ward your emails to Rick as I receive them (so he doesn’t have to wait a month), and will also share them in my next Let’s Talk Carv­ing col­umn. Until next month, gen­tle read­er, may your wood be plen­ti­ful and your tools stay sharp. Take care, carve lots, and always remem­ber to smile. A carv­ing friend, John Car­riere from Dar­win, Aus­tralia, emailed me that he recent­ly had com­plet­ed carv­ing his “found wood.” When I imag­ine drift wood, it isn’t any­where close to the 90 lbs., 15’ length of John’s found wood. Of course, I had lots of ques­tions; the first of many being what “shore” was he walk­ing along when he dis­cov­ered it. I knew you’d be inter­est­ed in all of John’s answers and his ter­rif­ic pho­tos of this mas­sive carv­ing. Dar­win is at the top end of Aus­tralia so the shore here would be the Tim­or Sea being part of the Indi­an Ocean. The east­ern part of Aus­tralia is where the Pacif­ic Ocean is and Dar­win is close to the west­ern part. I don’t know where this tree float­ed from but it did not appear to have been root­ed here. Indone­sia is north of Dar­win so there is a pos­si­bil­i­ty it came from there. I have final­ly fin­ished the large carv­ing. The pho­to does not do it jus­tice as a lot of carv­ings, with­in the carv­ing, do not show up very well. As it is drift wood, there was a bit of rot in some places. 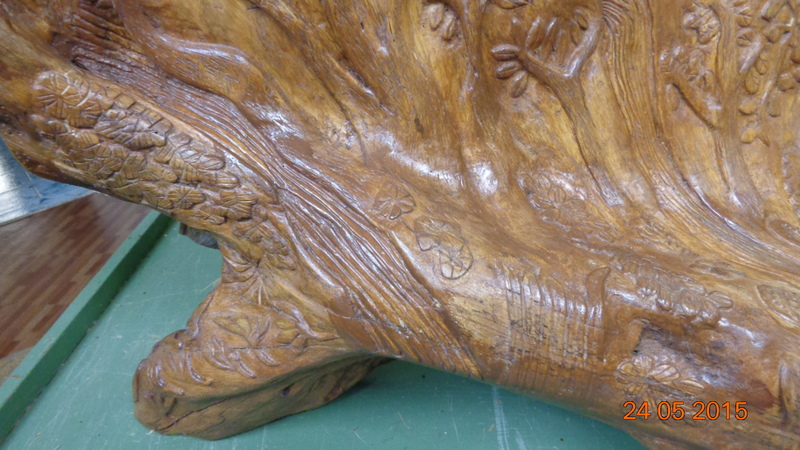 I found the trunk on the shore dur­ing a lunchtime walk about three years ago. Most of the tree was there, about 15 feet long. The flare or skirt at the bot­tom that helped to sup­port the tree was what drew my atten­tion to it. It was about a yard wide and tapered up like a tri­an­gle. It was too tempt­ing so I came back on the week end with a saw and a dol­ly. I cut out the tree and oth­er unwant­ed parts. The part I want­ed was very heavy, about 90 pounds and I had to tum­ble it up a bank of about 8 feet. I got it on the dol­ly and wheeled it to my car. I was in the process of get­ting a her­nia try­ing to tum­ble it into the trunk when a jog­ger came by and offered to help. I gra­cious­ly accept­ed it and we got it in the car. When I got home, I had to care­ful­ly tum­ble it out of the car. I then blast­ed it with the gar­den hose and got most of the mud and mold off of it. The rot in some areas got soft­er but remained. I left it out­side for about a year as I wasn’t sure what I want­ed to carve on it, but it lent itself to being a moun­tain. It got rained on for a wet sea­son of harsh trop­i­cal storms which addi­tion­al­ly cleaned it but pro­gressed the rot. Some sec­tions of it were hol­low so rain got in there. 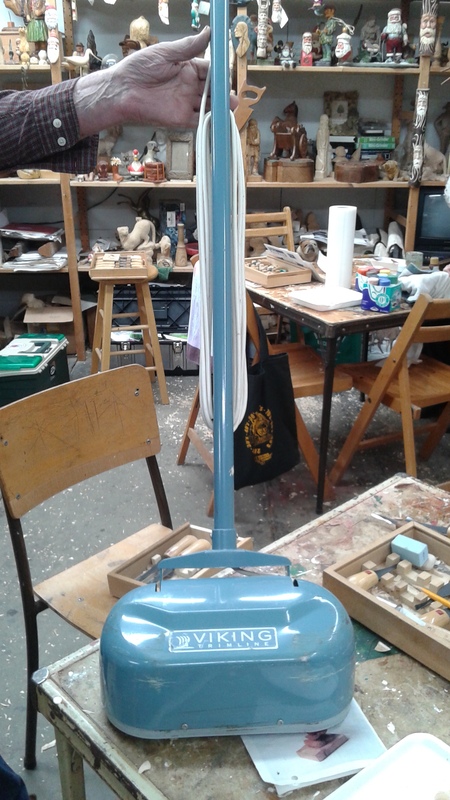 I car­ried out more prun­ing which reduced its weight con­sid­er­ably and brought it into my work­shop. I was still unsure of what to carve on it until I received my copy of the May-June 2014 issue of Chip Chats Mag­a­zine. The carv­ing of a moun­tain scape by Dylan Good­son gave me the idea of doing some­thing sim­i­lar. I copied the house on his carv­ing but the rest of the carv­ing is from my imag­i­na­tion. 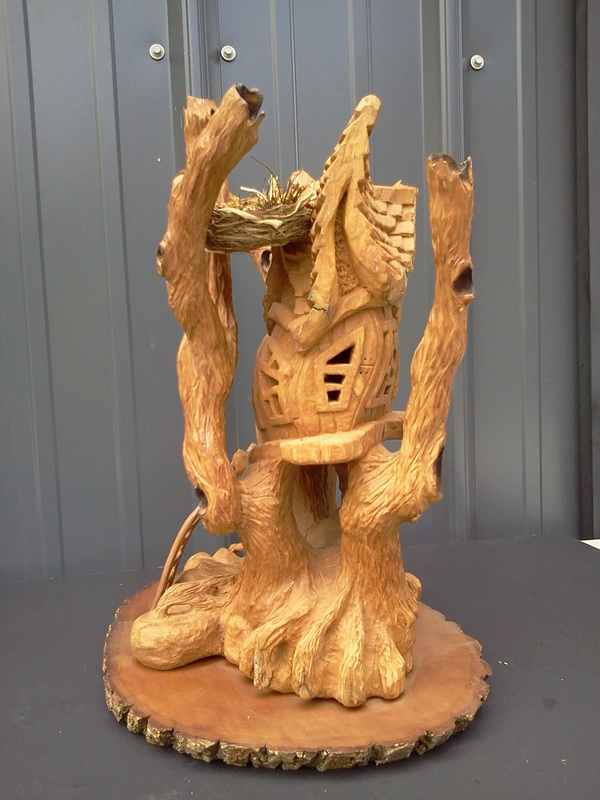 I did a lot of home­work on off cut pieces of wood to prac­tice carv­ing flow­ers, vines, shrubs, trees, etc. before carv­ing these on the blank. It took from mid Feb­ru­ary to mid May, about 350 hours to com­plete it. I have attached addi­tion­al pho­tos show­ing more detail of the indi­vid­ual carv­ings. There is also a pho­to of the back so you will have a bet­ter idea of what I had to con­tend with. So it stands by itself as the base of it is like a third of an upside down cone. I worked around and includ­ed some of the rot in some of the indi­vid­ual carv­ings. I made lib­er­al use of plas­tic wood when required. It took the stain quite well and is hard to notice. There is a round area under the house which was rot­ten. 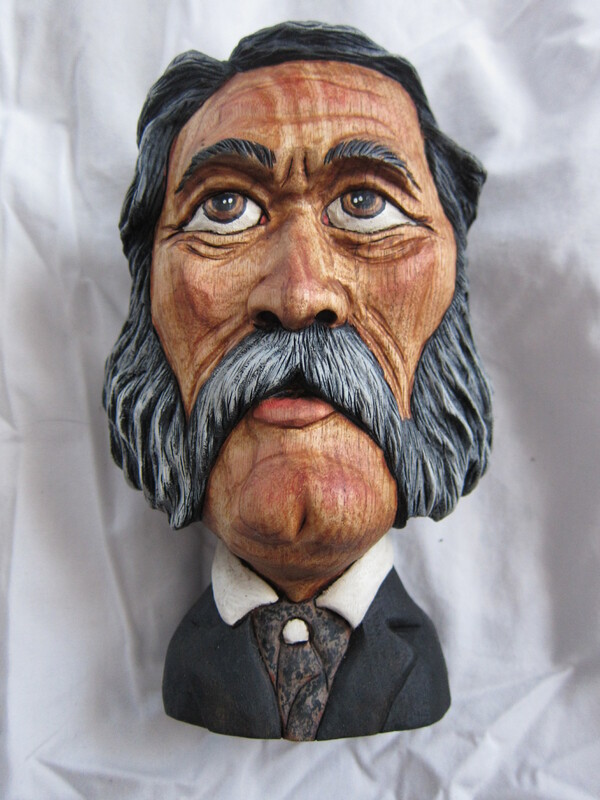 There was noth­ing I could do with it oth­er than to carve an imi­ta­tion boul­der in pine and glue it in. 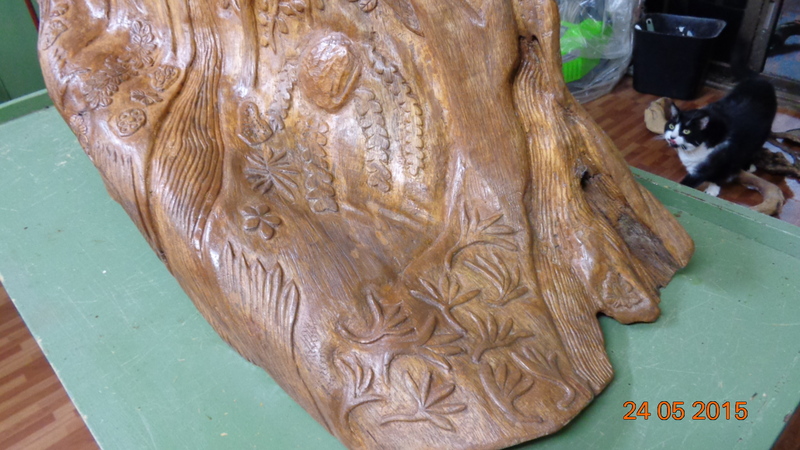 I carved some of it as it stood and laid if flat on my work­mate bench for most of the carv­ing. 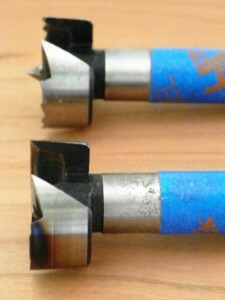 My edged tools were used for most of the carv­ings. The excep­tion was the stone work on the house where I used a Drem­mel with a small bit. I didn’t sand between the carv­ings in order to main­tain a rough sur­face sim­i­lar to grass, weeds etc on the sur­face of a moun­tain. 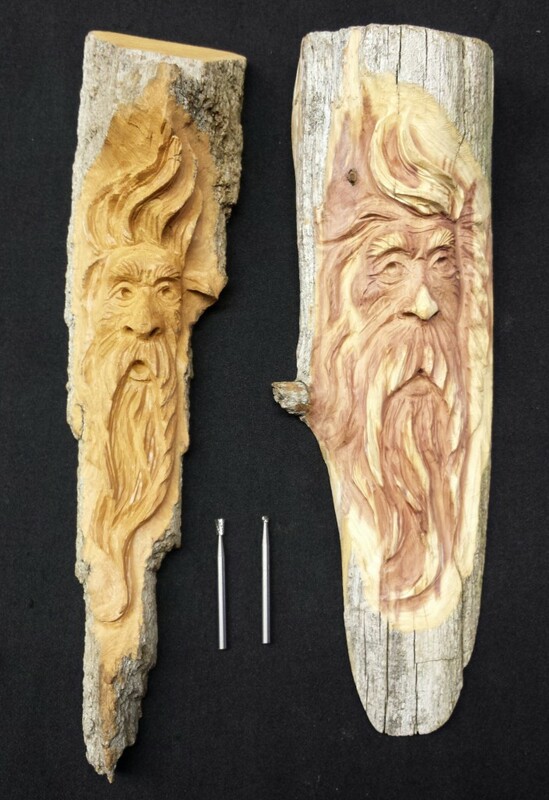 The trees were sand­ed to 180 grit but then roughed up with a v tool to sim­u­late bark. I have it on a wood box in my work­shop. The box is about 3 feet off the floor which is a good height for a line of sight to it. The fin­ish is Cabot oil based stain and var­nish (satin tint) fol­lowed by car­nau­ba wax applied with a shoe pol­ish­ing brush. It was then pol­ished with a com­bi­na­tion of a shoe brush and a tight fibre pol­ish­ing cloth used to pol­ish lim­ou­sines. It’s a hard wax to pol­ish and your arms are con­sid­er­ing claim­ing a divorce from your body, but the fin­ished sur­face is worth it. My daugh­ter, Tanya, has helped me with these pho­tos. If you have any oth­er ques­tions, don’t hes­i­tate to let me know. John, I doubt many of us will ever find, much less have the oppor­tu­ni­ty to drag home 90 lbs. of Indone­sia drift wood. Thank you so much for shar­ing the infor­ma­tion and pho­tos of your mas­sive carv­ing project. What a great carv­ing adven­ture! This Ain’t Your Grandmother’s Bird­house! Please refer to and fol­low all man­u­fac­tur­ers’ direc­tions. What I love about wood­carv­ing is that you nev­er know where it will take you – geo­graph­i­cal­ly, phys­i­cal­ly, philo­soph­i­cal­ly, or sculp­tural­ly. There will always be some­thing, around the next bend, that you nev­er could even imag­ine. 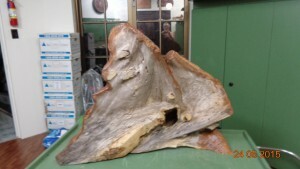 While attend­ing Rick Jensen’s bark pow­er carv­ing class, at Gene Webb’s School of Wood­carv­ing, I saw a carv­er, in the back row, qui­et­ly carv­ing a mon­strous piece of bark. His name was Howard L. Atwood. Howard hails from Asheville, North Car­oli­na and has been carv­ing since 2008. His bird­hous­es have been con­sis­tent award-win­ners. One of his entries won a first prize of $1,000, plus two-nights at a bed and break­fast, includ­ing din­ner! Howard told me his bark carv­ings have been great­ly influ­enced by Carv­ing Illustrated’s 2014 Carv­er of the Year, Rick Jensen. 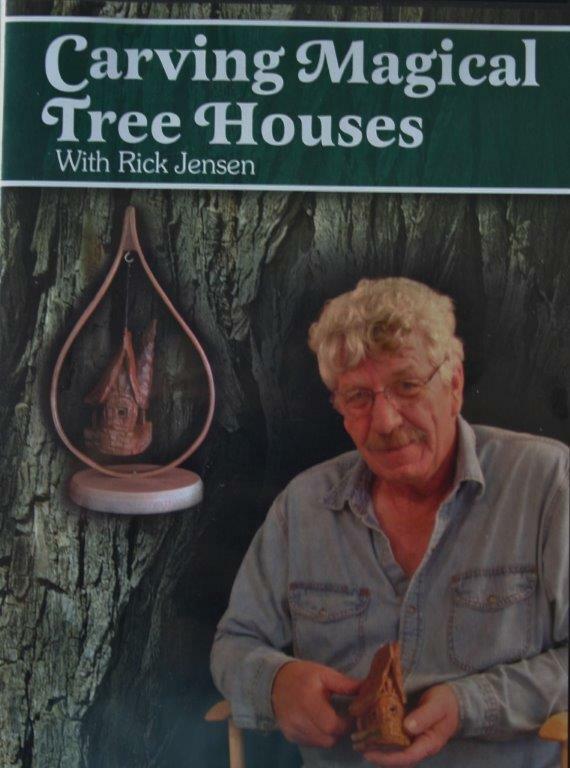 After watch­ing Rick’s DVD, Carv­ing Mag­i­cal Tree Hous­es, Howard decid­ed to take Rick’s bark carv­ing class. That was sev­en years ago. Howard has tak­en Rick’s class every year since then. 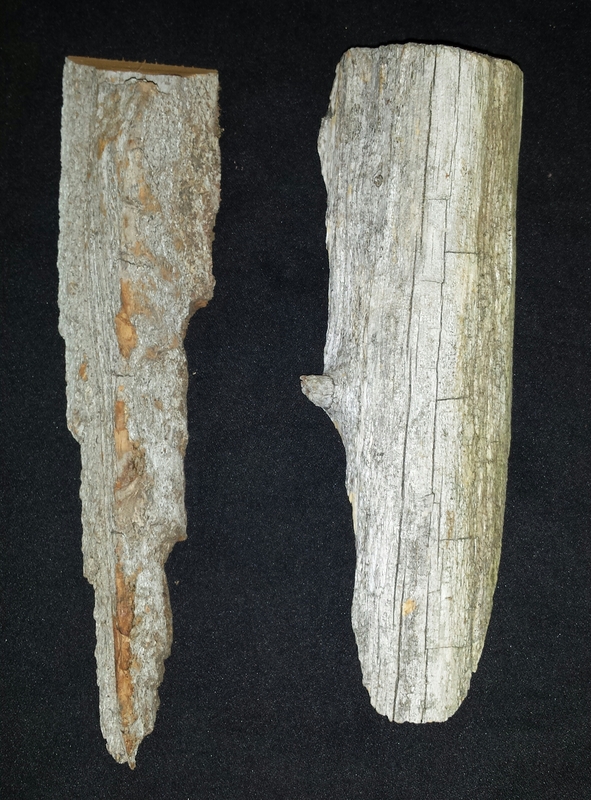 The size of the bark, used in these pho­tos, is approx­i­mate­ly 24” high by 20” deep and 18” wide. 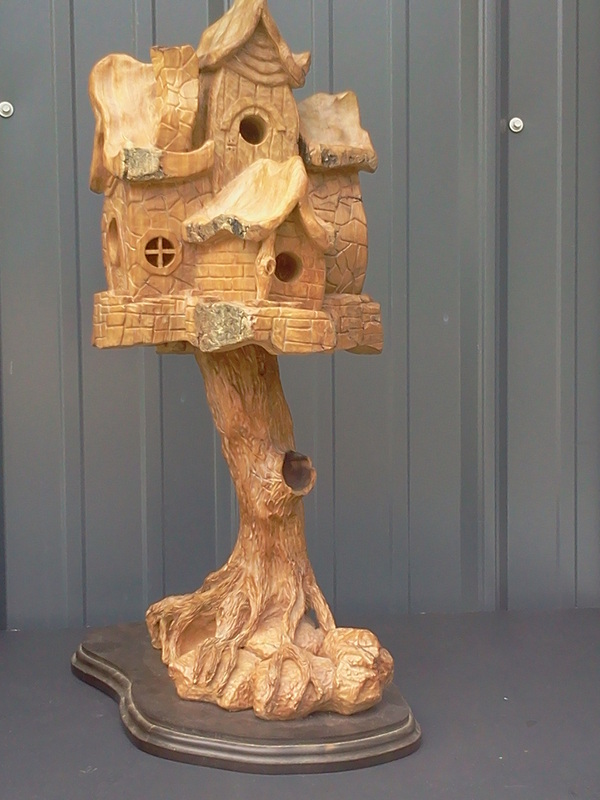 Rick Jensen glued up more than 8 indi­vid­ual pieces of bark for Howard’s bird­house. It’s those per­fect cir­cu­lar open­ings that caught my atten­tion. The unique roof line brings your eye to the nest. 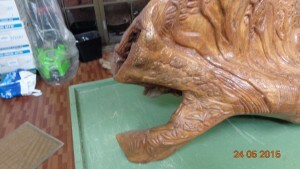 The side view shows per­fect pro­por­tions to the sculp­ture. 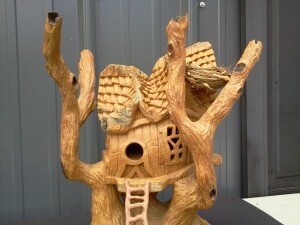 The nest shows Howard’s atten­tion to detail. What intrigued me, beyond the beau­ty and grace of these bird­hous­es, were the per­fect­ly round open­ings. How did Howard cre­ate them with­out leav­ing that lit­tle hole in the wood that comes with a Forstner bit? 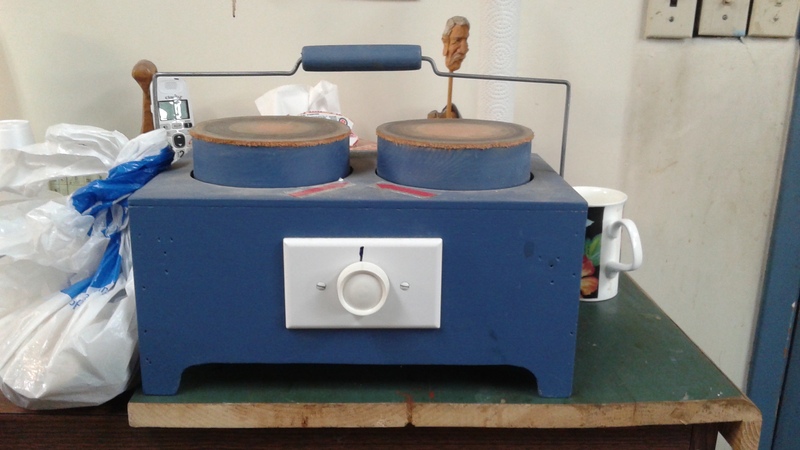 Howard advised that he mod­i­fied his Forstner. First he went to his bench grinder to remove the point, and then he con­tin­ued to low­er the point until it was flush, using the two stone bits pic­tured. Good think­ing, Howard! 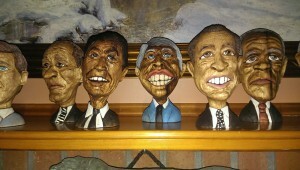 You can view more of Howard’s carv­ings by vis­it­ing his web­site: www.AandAcrafts.com. I received the fol­low­ing email and pho­tos from Ron Karo, New York. Ron isn’t a carv­er, but he knows great carv­ings when he sees them. While trav­el­ing through Ten­nessee, he came upon two of Gene Webb’s Pres­i­den­tial bust carv­ings and knew he had to have 42 more. I couldn’t share all the pho­tos Ron sent me, but if you click on the Gene Webb’s School of Wood­carv­ing link that should be locat­ed bot­tom right of this col­umn, you can see all of 44 of the pres­i­dents. Basi­cal­ly, I’ve nev­er met Gene. We hap­pened upon his work while dri­ving through the moun­tains on our way to Dal­las. There we found [and pur­chased] the two orig­i­nal pres­i­den­tial carv­ings of Oba­ma and Bush Jr… Upon our return to upstate NY, we con­tact­ed Gene about carv­ing all the pres­i­dents. He agreed. Over the next two years we exchanged pho­tos, car­toons, sculp­tures and his­tor­i­cal images culled from the web and books. We used these to design the busts. Now all are done…all 44…….one is bet­ter than the next. They are tru­ly ter­rif­ic. He [Gene] is the best carv­er alive. Ever pick up a piece of drift wood at the water’s edge? Bet it wasn’t as large as the drift wood John Car­riere, from Aus­tralia, found on the beach dur­ing a lunchtime stroll. 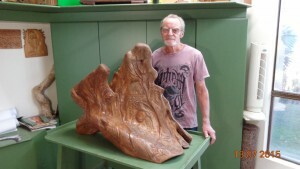 John’s drift­wood weighed in at over 90 lbs. Next month, I’ll share how John got the wood home (a jog­ger helped), how he treat­ed the piece and what he ulti­mate­ly decid­ed to carve. 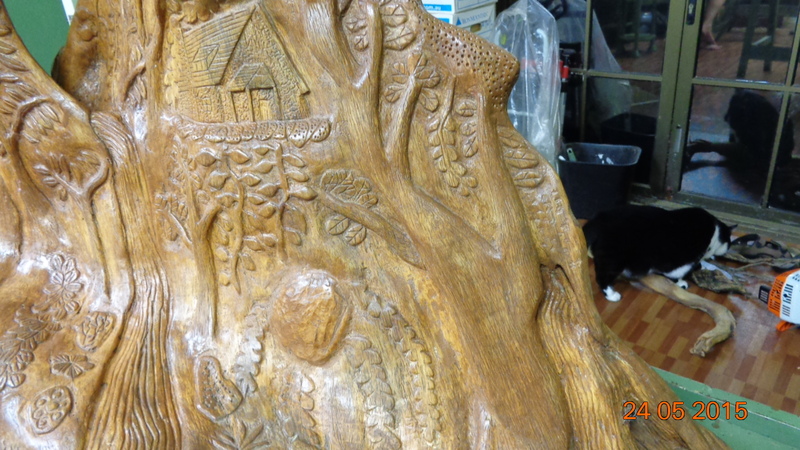 Carvers help­ing carvers … all the way from Aus­tralia. Does it get any bet­ter than here at WOM? Real­ly?? 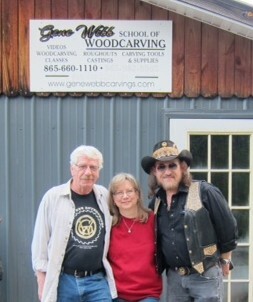 Please join me in wel­com­ing Wood­carvers On-Line Magazine’s newest spon­sor, Gene Webb’s School of Wood­carv­ing locat­ed in the Smoky Moun­tains in Townsend, Ten­nessee. 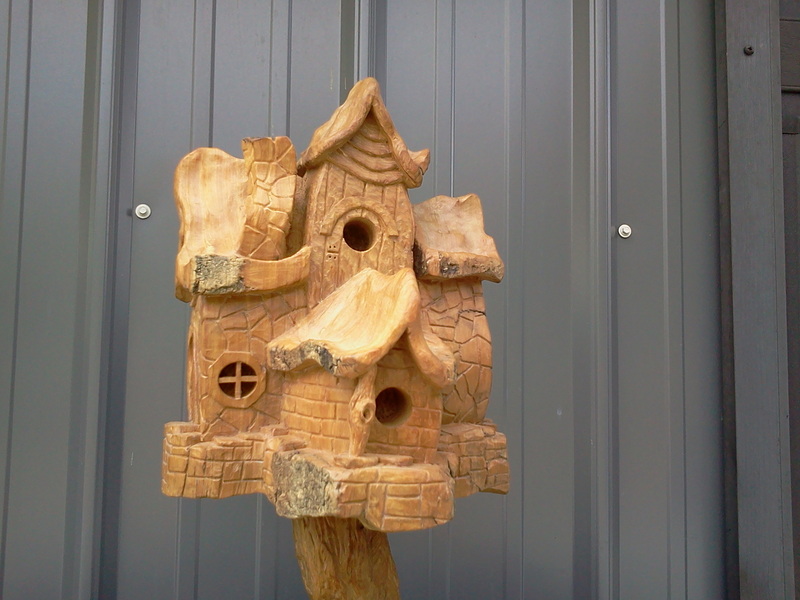 Just go to the right and click on his link and you will be tak­en direct­ly to Gene’s wood­carv­ing shop where you’ll find tools, carv­ings, DVDs, bits and burs. Or, you can speak to Gene Webb at: 865–660‑1110. If you ever saw my stu­dio, you would know my heart is firm­ly enmeshed in edged tools. I own micro tools, palm tools, Euro­pean sized and mal­let tools, and dozens of knives of all shapes and sizes – from ½” blades to hog­ging knives. I unabashed­ly love tools. I see, in each one of them, the raw met­al that came from the earth. I can imag­ine how it was fired, ham­mered and sharp­ened. And then the tool came to live with me…forever and ever. Bot­tom line: Yes. I have seen the doc. Can’t do much about it. I have arthri­tis. It’s not rheuma­toid. Got some meds. Tried mis­cel­la­neous home reme­dies, all of which do some good. Will it stop me from carv­ing? No. But, is it slow­ing me down? Yes. DANG IT!! A while back, I pur­chased a Fore­dom and then a RAM think­ing I could use pow­er in lieu of edged tools, at least for rough­ing out a carv­ing. I found pow­er just didn’t work for me. The burs bounced and stuck and jumped and skid­ded across the carv­ing. I didn’t want to give up. I tried dif­fer­ent types of burs, then dif­fer­ent sized burs, and final­ly dif­fer­ent amounts of pow­er. My carv­ings were so ugly, the only rea­son I kept them was because they were the excel­lent exam­ples of bad pow­er carv­ing. This was why I took Rick Jensen’s pow­er carv­ing class last month. I was cer­tain that six days of pow­er carv­ing under Rick’s tute­lage had to point me in the right direc­tion. And, boy, was I right! Plus, I can report that I expe­ri­enced only a min­i­mum amount of pain in the days that fol­lowed. Best of all, in addi­tion to pow­er carv­ing, I still used my first love — edged tools — just not as often. Tak­ing Rick’s class was a bless­ing. Sit­ting next to Gene Webb made it a dou­ble bless­ing. While Rick taught us how to pow­er carve a bark house, stairs, rocks and a San­ta, I was keep­ing my eye on Gene as he pow­er carved wood spir­its and Amer­i­can Indi­ans. 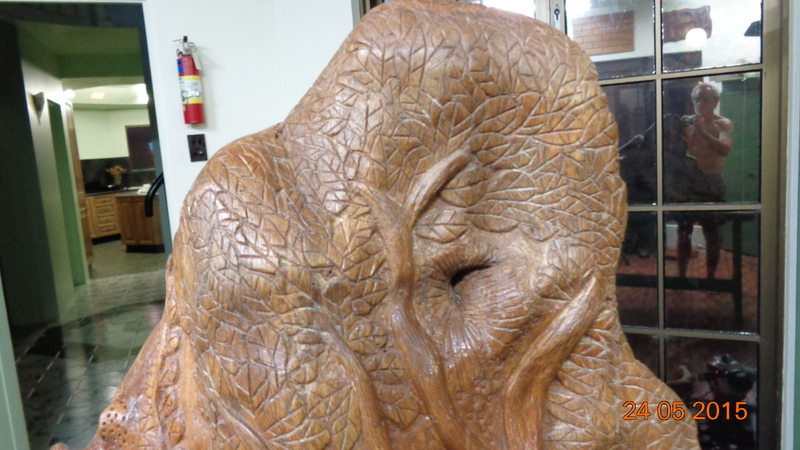 I had the oppor­tu­ni­ty to learn from two mas­ter carvers. The week I returned home, I thought about this col­umn and that many of you may want to con­sid­er pow­er carv­ing for the same rea­son I was pur­su­ing it. Six days of pow­er carv­ing in Ten­nessee helped me nail the basic tech­nique, but I cer­tain­ly am not expe­ri­enced enough to advise you what bits or burs to start with. So, I called Gene Webb and asked his advice. My ques­tion to Gene was, “What burs would you rec­om­mend to a WOM read­er who wants to try pow­er carv­ing.” Gene, of course, sur­passed what I expect­ed. He pro­vid­ed us not only with which burs to begin with, but carved two wood spir­its and took a pro­gres­sion of pho­tos to help us under­stand each bur’s use. I think four burs would be best. 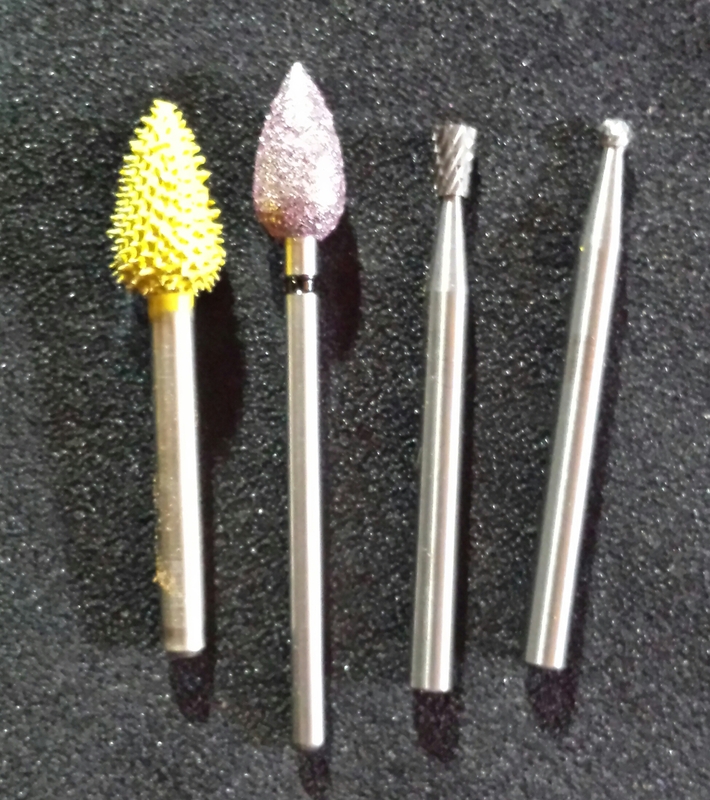 These four burs com­plet­ed the two carv­ings I am about to show you. These burs will also work on bass­wood, and walk­ing sticks. #1 is a Sabur­tooth, yel­low flame. 1/8th” shaft. I use it for rough­ing out small spir­its, Indi­an, etc. #2 is a super coarse ruby. I used it to smooth them up. 3/32 shaft. #3 is a dou­ble cut car­bide dove­tail. 1/8″ shaft. I used it on the hair. #4 is a 1/16′ Sphere Dou­ble cut car­bide ball. 1/8″ shaft. I used it for the mouth, nose and eye holes. These are small carv­ings. One is cot­ton wood bark, the oth­er is cedar. These small spir­it carv­ings are signed and dat­ed. They retail for $30.00 and are approx­i­mate­ly 2’‘ wide and 6’’ long. FYI: I already pur­chased Gene’s cedar wood spir­it. The cot­ton wood bark spir­it may still be avail­able. 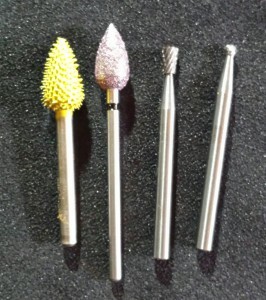 If you think you may want to jump into pow­er carv­ing, like I did, Gene has put togeth­er a carv­ing bur kit that has every­thing need­ed to do most small projects. The kit is list­ed on his web­site for $105.95 (about a $15 sav­ings, which is the cost of a bur). 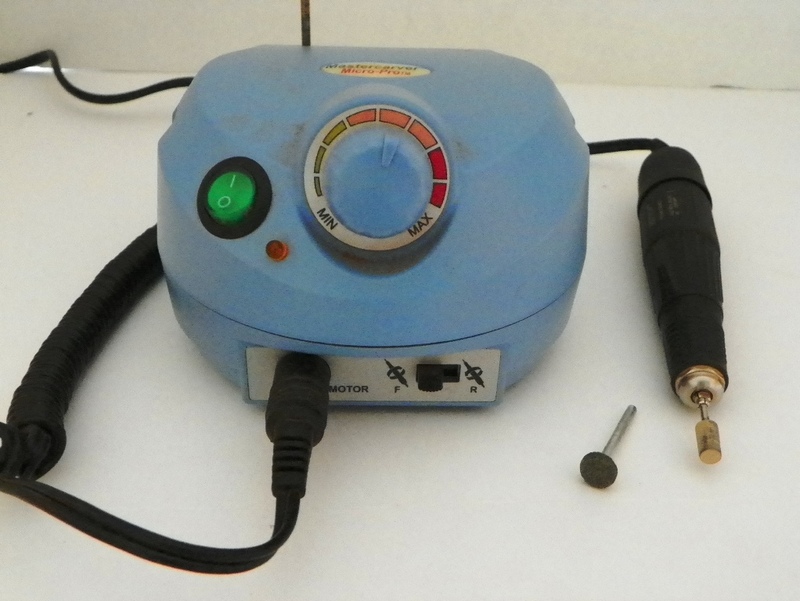 The kit includes a sander that Gene uses on his carv­ings, and of course, you can call Gene at 865–660‑1110 when you need advice or get stuck, and he will get back to you as soon as he is free. 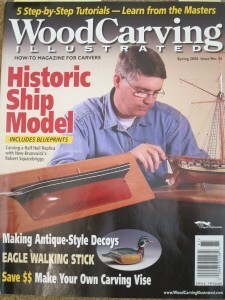 And, once more, I want to thank Gene Webb’s School of Wood­carv­ing for spon­sor­ing Wood­carvers Online Mag­a­zine. Carvers help­ing carvers!! The two-day chain saw carv­ing sem­i­nar I took from Gene was awe­some! 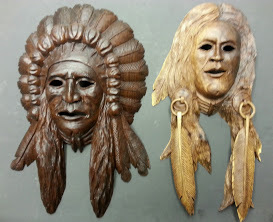 I roughed out a cedar wood spir­it and an Amer­i­can Indi­an. I admit to wound­ing the chair, but it sur­vived. I came back with a lot of knowl­edge and all my appendages intact. It was great! Just read your arti­cles in WOM. I researched my old wood carv­ing mag­a­zines and found three arti­cles that John Mitchell might like to look up. All are in the British Wood­carv­ing mag­a­zines. One of them is in the July/August 2001 issue page 22 enti­tled “Skilled Hands” by Pete Ben­son. Anoth­er is in the September/October 1997 issue, page 37 enti­tled “Give Him a Hand” by Derek Old­bury. The oth­er one is in the May/June 2001 issue, page 17 enti­tled “Lend­ing a Help­ing Hand” by Michael Painter. I hope they can be of assis­tance to him. I am work­ing on a large relief carv­ing at the moment. It is a moun­tain­scape about 700mm (2.5 feet) wide by about 900 mm (3 feet) high. It is part of a tree trunk I found on the shore. I have been try­ing out a neg­a­tive ion gen­er­a­tor in my studio/workshop. The prin­ci­ple is that neg­a­tive ions gen­er­at­ed from the gen­er­a­tor cling to dust par­ti­cles, mak­ing them heavy enough to fall to the floor, thus clean­ing the air. A spin off is that there is a very pleas­ant smell from the neg­a­tive ions. 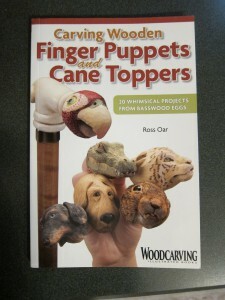 You might like to look into this as a future tip for wood­carvers. 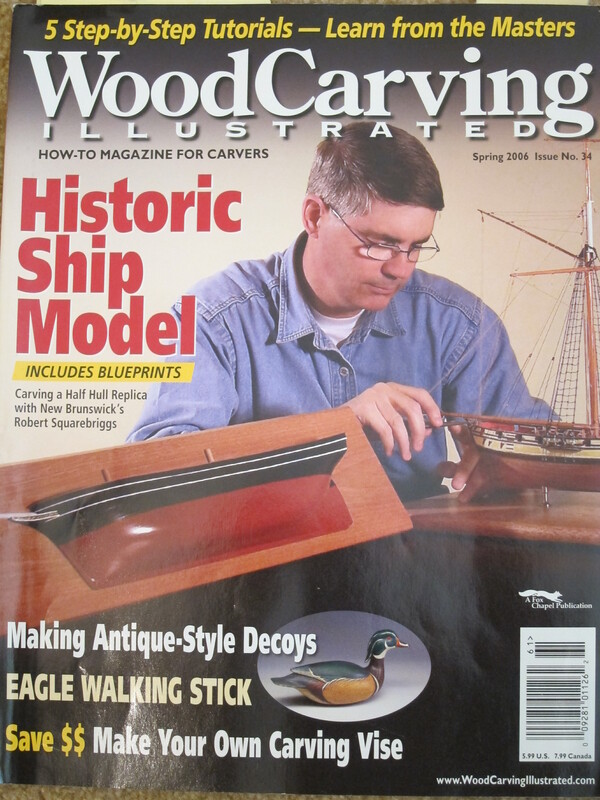 John, thank you so much for tak­ing the time to research your back issues of the British Wood­carv­ing Mag­a­zine. Good luck on your moun­tain­scape. Also, please let us know if the neg­a­tive ion gen­er­a­tor actu­al­ly does help clean the air of dust par­ti­cles. We all would be inter­est­ed in that! If any of our read­ers now use, or have had any expe­ri­ence using a neg­a­tive ion gen­er­a­tor in their work­shop, please drop me an email using the form below, or at SusanAlexanderCarves@comcast.net, and I’ll share your expe­ri­ence with the rest of the WOM read­ers. 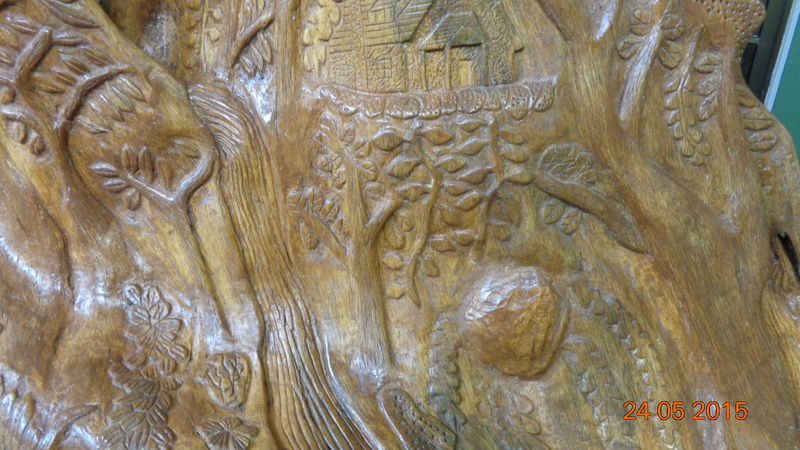 Next month, I’ll show you the “Ulti­mate Bird­hous­es” that Howard Atwood carves. They are absolute­ly amaz­ing! Howard was kind enough to allow me to share, with you, how he mod­i­fied a spe­cif­ic tool for his bird­hous­es, with great results. 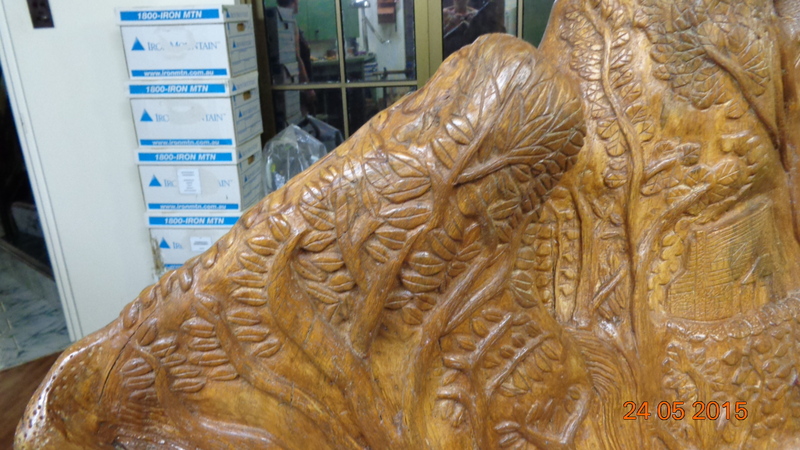 Carvers help­ing carvers! I spent six glo­ri­ous days with Wood­carv­ing Illustrated’s 2014 Wood­carv­er of the Year, Rick Jensen. He taught two back-to-back, three-day bark carv­ing sem­i­nars. Rick’s projects includ­ed carv­ing a bark house with a spi­ral stair­case, and a San­ta with jin­gle bells on a leather belt. Rick held his sem­i­nars at Gene Webb’s School of Wood­carv­ing locat­ed in the Smoky Moun­tains in Townsend, Ten­nessee. Rick plans to return to Gene’s stu­dio April 1 thru 6, 2016. As in 2015, both pow­er and edged tools will be used. The 2016 sem­i­nar has a max­i­mum of 10 stu­dents. 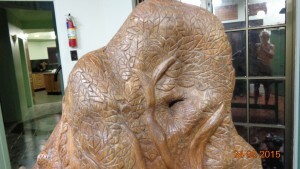 9 carvers have already giv­en Rick a $100 deposit to hold their space. If you are inter­est­ed, call Rick at 218–281-5107 for the project’s details. As luck would have it (mine, not his), Gene Webb’s per­ma­nent carv­ing sta­tion was locat­ed next to mine, which allowed me to observe him pow­er carve an Amer­i­can Indi­an mask. I’m cer­tain I must have annoyed Gene with a series of ques­tions about pow­er carv­ing. 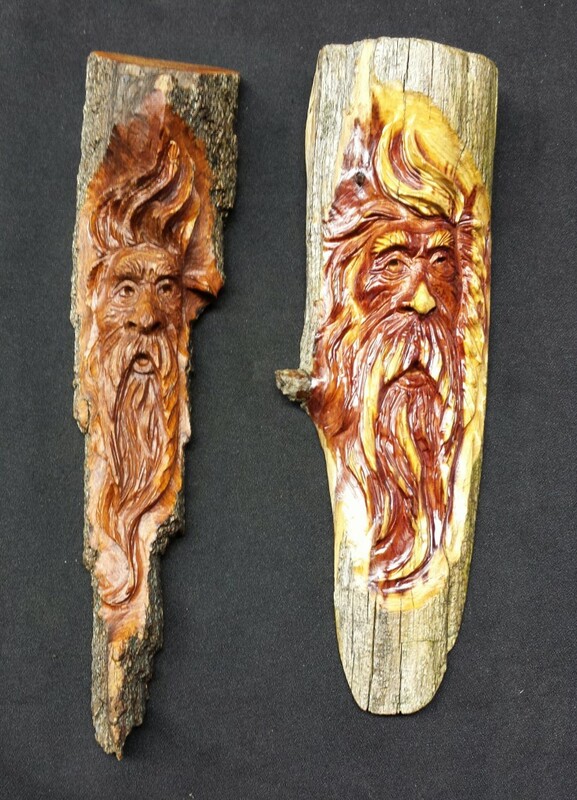 How­ev­er, Gene, who has carved for over 40 years, won numer­ous Blue Rib­bon, Best of Show and People’s Choice Awards, was a true Ten­nessee artist, instruc­tor and gen­tle­man. He kind­ly answered each of my ques­tions with grace and patience. Gene carved his mask in spald­ed maple wood using an NSK and Fore­dom. He took the time to explain which bits he chose to use, and the thought process behind his choic­es. I was fas­ci­nat­ed because I sel­dom have had any luck with pow­er carv­ing. 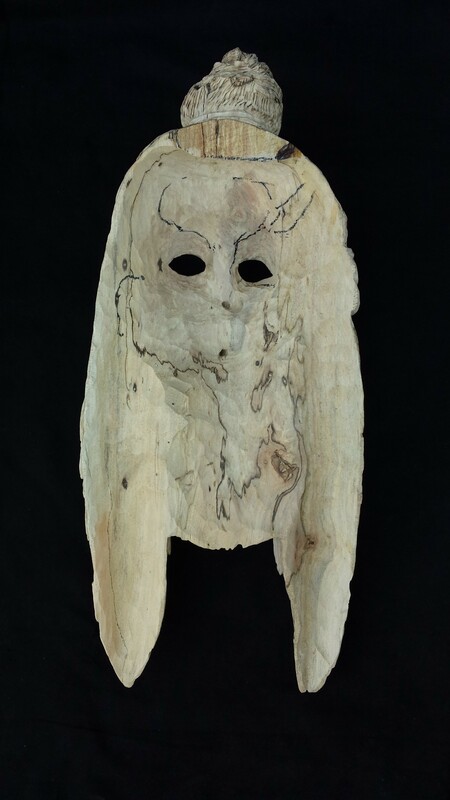 Gene carved the front of the mask before hol­low­ing out the back, leav­ing some del­i­cate por­tions only ¼” thick – so thin you could see light if you held it up to a lamp. After Gene hol­lowed the back of the mask and carved in a hang­er, he buffed the entire carv­ing, front and back, with dif­fer­ent fab­ric-backed grits of sand­pa­per he mount­ed on a man­drel and loaded onto a Fore­dom. Gene then took a wood burn­er to the mask. I asked him to take a pho­to for us when it was ½ burned, so you could see the remark­able dif­fer­ence burn­ing made to the carv­ing. 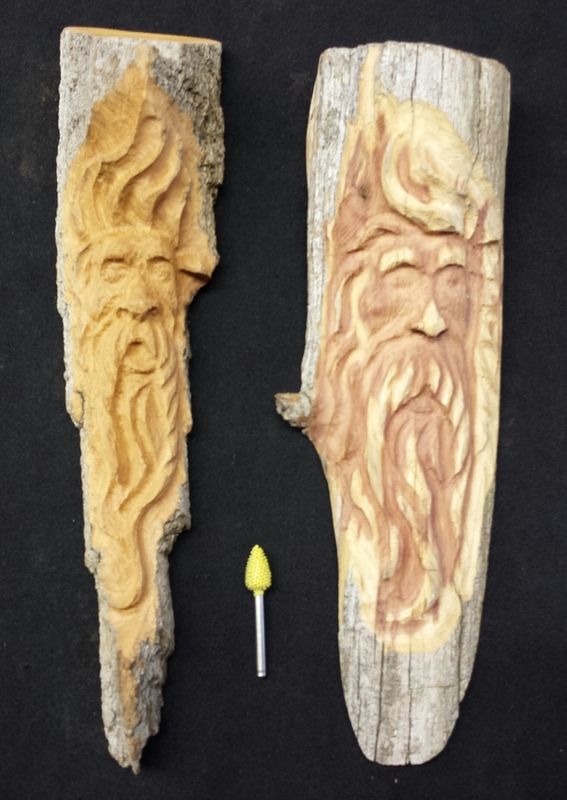 After wood burn­ing, Gene applied a fin­ish, which dark­ened the wood dra­mat­i­cal­ly. The final carv­ing was 15” tall by 6” wide. I was so enthralled with the entire process that I pur­chased Gene’s DVD, Pow­er Carv­ing an Indi­an Mask, watched it that evening in my room (after carv­ing for 9 hours with Rick), and the next day went back and pur­chased Gene’s Pow­er Carv­ing a Tree Spir­it DVD. Gene has 19 DVD’s at $22.95 each. Even though I prob­a­bly will nev­er carve a mask, I’ll refer to Gene’s DVD when I attempt to pow­er carv­ing an Indi­an face. There are numer­ous things I like about Gene Webb’s DVDs. While they are pro­fes­sion­al­ly pro­duced, they don’t feel staged. Like many things that are done cor­rect­ly – you don’t notice that the sound, cam­era angles and light­ing were well thought out. Gene has an easy way of explain­ing the art of carv­ing. His friend­ly man­ner and expla­na­tions of bits, carv­ing tools and carv­ing meth­ods belies his numer­ous awards and 40 years of carv­ing expe­ri­ence. When I watch Gene’s DVDs, I feel like I’m get­ting great advice from a carv­ing friend and neigh­bor. I told Gene I want­ed to tell you, the WOM read­er, how much I enjoyed his DVDs and he said that should any of you decide to pur­chase one of them, if you men­tion my name, you can email him a pho­to of your carv­ing and he’ll cri­tique it at no charge. I know I’ll be tak­ing advan­tage of that offer. When you have a moment, check out Gene Webb’s web­site at www.GeneWebbCarvings.com. You’ll find a lot of inter­est­ing carv­ing items on Gene’s site, includ­ing bits, books and tools. If you are ever in the area, or would like to take a trip to the Smoky Moun­tains, Gene offers indi­vid­u­al­ized carv­ing instruc­tions for $150/day or $200/2-day class. Depend­ing upon the sub­ject mat­ter, he also offers week-long class­es. While Gene is flex­i­ble, depend­ing upon his sched­ule, pow­er carv­ing, edged tool class­es (or a mix­ture of both) are usu­ally held the first week of the month. My trip to Townsend, Ten­nessee has reaped WOM read­ers an addi­tion­al ben­e­fit. Gene has agreed that if a WOM read­er has a carv­ing ques­tion, you may call him at 865–660-1110. Men­tion my name, and Gene will get back to you as soon as he is free. 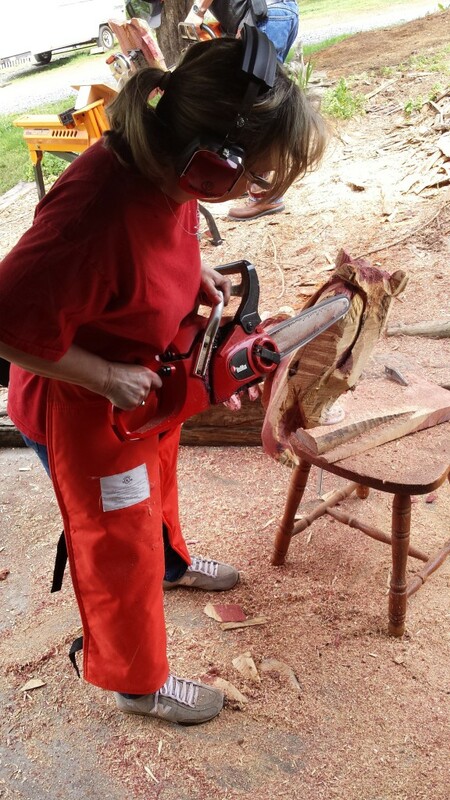 Carvers help­ing carvers! 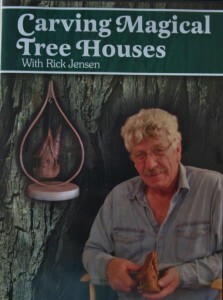 Fol­low­ing my sem­i­nars with Rick Jensen, I adven­tur­ous­ly signed up for Gene’s 2-day pri­vate chain saw class. I hope to rough out two projects — one per day — an Amer­i­can Indi­an and a wood spir­it — both from a slab of cedar log. I don’t know whether you should send your good luck wish­es to me or Gene. I’ve nev­er picked up a chain saw before. Best send them to Gene. 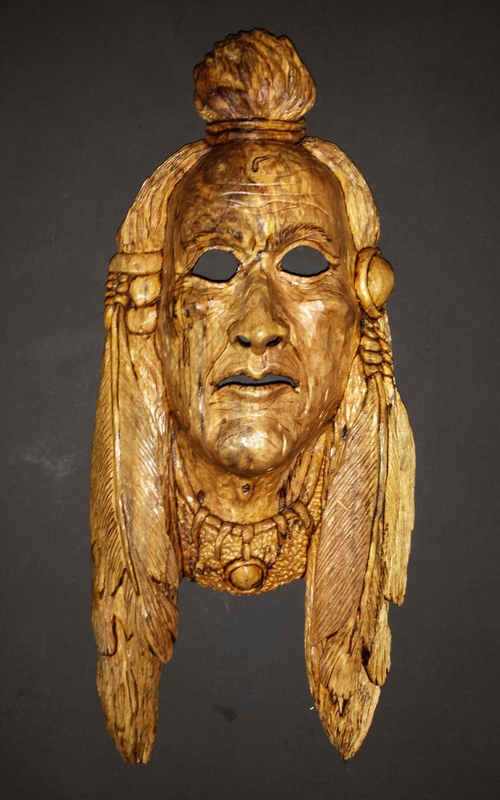 Here are a few pho­tos of past masks Gene has carved. Vis­it his web­site to see more of his carv­ings. I received an email from John Mitchell. He’d like to carve an in-the-round carv­ing of pray­ing hands, and is ask­ing if any­one can pro­vide him with plans. If we couldn’t pro­vide him with plans, John said he saw an arti­cle in a mag­a­zine that gave full instruc­tions for carv­ing pray­ing hands, but can’t recall the issue or name of the mag­a­zine. Can any read­er point John in the right direc­tion? Use the form below to email me, or send the infor­ma­tion to SusanAlexanderCarves@comcast.net and I’ll for­ward it to John as well as print it in my next Let’s Talk Carv­ing col­umn. Last month, Shorty Short’s (from Shorty’s Wood Shop) sent us a TIP that sug­gest­ed when we look at a carv­ing we turn off the lights from time to time and have one small light off to the side when exam­in­ing our carv­ing, I received an email from Joe But­ler remind­ing us that look­ing at our carv­ing in a mir­ror will give us an entire­ly new per­spec­tive that will allow us to see what parts of our carv­ing are out of synch. Thanks, Joe. It was good hear­ing from you. Let me add that when you view your carv­ing in the mir­ror, have a pen­cil with you. While look­ing in the mir­ror, put your fin­ger on the spot that needs adjust­ing. When you turn the carv­ing back to face you, mark that spot with your pen­cil. That way, even if you put your carv­ing down for a day or two, you’ll know exact­ly what needs to be adjust­ed once you begin carv­ing again. Last month, I shared Jan Oegema’s email with you regard­ing attach­ing fur­nace fil­ters to a box fan. First of all, my sin­cere apolo­gies to Jan because I spelled his last name incor­rectly. While I kept a few of his vow­els and con­so­nants, Jan’s last name is def­i­nitely not Omega. It must have been a Freudi­an slip because I have recent­ly begun to study the Greek lan­guage, which, of course, includes the let­ter Omega. Sor­ry about that, Jan.
Not only did Jan accept my apolo­gies, being a great carv­er, he sent me a few more pho­tographs and TIPS to share with you. In this pho­to you’ll rec­og­nize the fil­tered box fan that Jan referred to last month. It is inter­est­ing to see how Jan secured it to the ceil­ing. I’ll let Jan tell you, in his own words, about the sec­ond batch of pho­tos he sent us. When I first received them, I thought the pho­to below was of a small vac­u­um sweep­er so I emailed Jan for an expla­na­tion. The pic­tures show a floor pol­ish­er NOT a vac­u­um. I con­vert­ed the floor pol­ish­er into a sharp­en­er. I take the whole pol­ish­er apart and build a case around the motor. 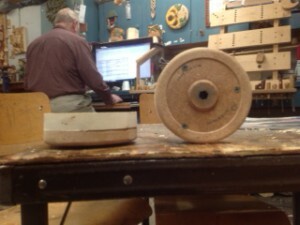 Then I take the brush­es out of the round hold­ers and screw a piece of wood on there (as seen in the pic­tures). Glue a piece of leather on the wood (suede side up). From the han­dle I use the switch and the cord and use a used Kitchen draw­er han­dle so I can take it with me on tour. Often I make a sec­ond round set with 200 grit sand­pa­per. I wish I was hand­i­er, but it was cer­tain­ly inter­est­ing see­ing what Jan can do with a floor pol­ish­er! My Warn­ing to WOM Read­ers: Only if you are very famil­iar and schooled and con­fi­dent in your mechan­i­cal and elec­tri­cal abil­i­ties and the type of equip­ment Jan has tak­en apart and put back togeth­er, should you even con­sider attempt­ing what Jan has accom­plished. You know who you are. I know I couldn’t morph a floor pol­isher into a sharp­ener with­out injur­ing myself or set­ting fire to my stu­dio. Until next time, gen­tle read­er, may your wood be plen­ti­ful and your tools stay sharp. Take care, carve lots, and always remem­ber to smile. We take so many every­day things for grant­ed. While I try to be grate­ful for the many bless­ings life has bestowed on me, with carv­ing and my carv­ing friends high on my list, some of the sim­plest mir­a­cles escape my atten­tion because I didn’t know they even exist­ed. Those were my thoughts as I lis­tened to David J. Lin­den, an Amer­i­can pro­fes­sor of neu­ro­science at The Johns Hop­kins Uni­ver­si­ty School of Med­i­cine, being inter­viewed on the radio. 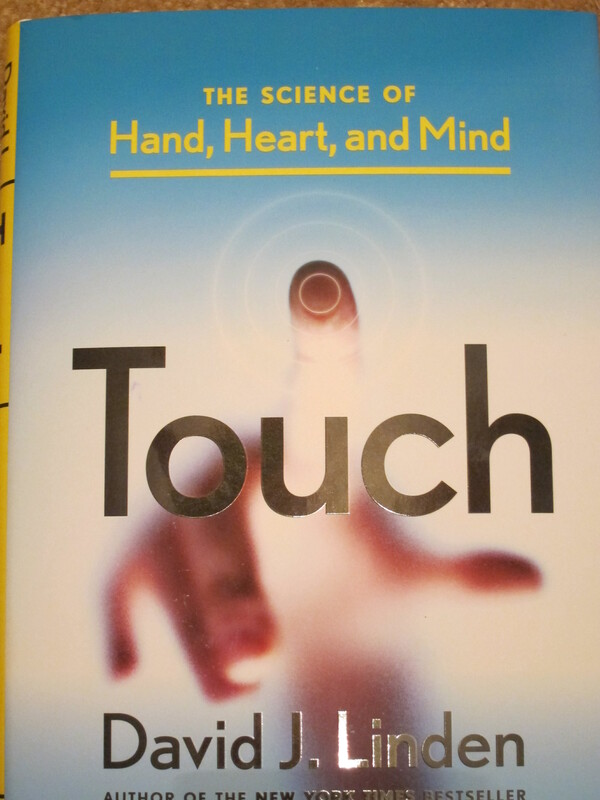 When the inter­view con­clud­ed, I ordered his book Touch – The Sci­ence of Hand, Heart and Mind so I could share two facts about touch that he dis­cussed. Although Lin­den spoke on sev­er­al aspects of his book, the first of two items that caught my atten­tion was his point­ing out that when we hold a tool, do we real­ize that we are able to actu­al­ly feel what the end of the tool has touched? Stop for a moment and think about this. It was some­thing I had nev­er con­sid­ered. Accord­ing to Lin­den, this is pos­si­ble because although our hands have four dif­fer­ent touch recep­tor sys­tems, it is the 350 Pacin­ian cor­pus­cles (that look like a tiny cross-sec­tion of an onion) in each fin­ger that allow us to feel what the end of the tool has touched. The Pacin­ian cor­pus­cles are extreme­ly sen­si­tive to tiny vibra­tions, and each vibra­tion received sends fire spikes to our spinal cord and then on to our brain stem so we can inter­pret what the end of our tool is doing. So the rea­son you can feel the dif­fer­ence between carv­ing bark and carv­ing wal­nut is because of the 350 Pacin­ian cor­pus­cles in each of your fin­gers turn­ing the tool’s vibra­tions in your hand into ener­gy and send­ing fire spikes rac­ing to your spinal cord and then up to your brain. Ever cut your­self – deeply – then said, “Oh *&%# that is gonna hurt!” and wait­ed for the pain to hit? In Linden’s book, he explained the rea­son for the inter­lude between the first pain we feel and the sec­ond pain that arrives after­wards. The ini­tial pain we feel trav­els to our brain fast. It’s car­ried to our spinal cord and up to our brain by a mix­ture of two types of fibers – A-delta and A-beta. The A-beta fiber trans­mits that first painful elec­tri­cal spike at 150 miles per hour. 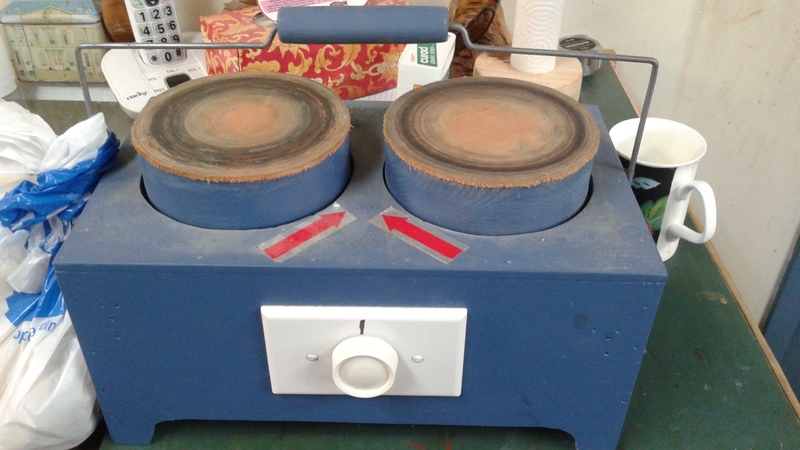 It tells you to stop cut­ting your­self … or to take your hand off the hot pot. In oth­er words: THIS HURTS – STOP NOW! The sec­ond wave of pain (that you wait for) is trans­mit­ted by C-fibers that trav­el at only 2 miles per hour. This pain’s pur­pose is to demand you do some­thing to pro­mote heal­ing – like stop­ping the bleed­ing. Isn’t it amaz­ing that elec­tri­cal spikes are trav­el­ing through our body at 150 miles per hour, and we are total­ly unaware of it? And, isn’t it a coin­ci­dence that the author’s last name, Lin­den, is also the name of the lin­den tree, com­mon­ly known as bass­wood? Hmm­mm. Now, if any­one asks why you carve so often, you can smile and tell them that you are improv­ing your mind’s abil­i­ty to inter­pret long-range touch infor­ma­tion. I received a very inter­est­ing TIP from a carv­er named Shorty Short. I am a hob­by­ist carv­er. I use to sell my work on-line by request order. 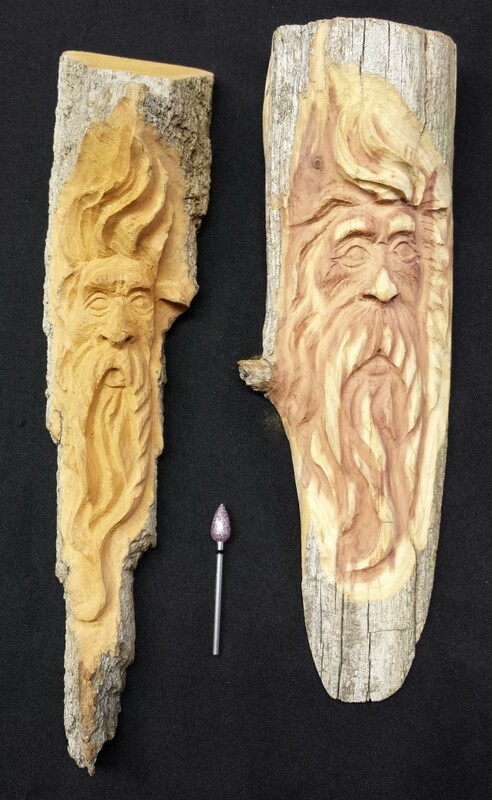 Since my wife died I just carve what I want and give them away. My sug­ges­tion is one of my dis­abil­i­ties that I have dis­cov­ered ben­e­fi­cial. I am almost total­ly col­or­blind. When look­ing at pic­tures or live fig­ures such as birds, rep­tiles or facial fig­ures turn off the lights from time to time and have one small light off to the side when exam­in­ing your piece. Let the shad­ows show you what you need to enhance or bring out. Carv­ing is cre­at­ing illu­sions mak­ing a 1/4″ nose look extreme­ly large. Some­times col­or can mis­guide your desired out­come. Try it and see if it works for you! Fas­ci­nat­ing! This is some­thing I’ll def­i­nite­ly try. Thank you, Shorty! I make eagle canes for wound­ed war­riors. I use a design from WCI spring 2006 issue 34 page 64. It is real­is­tic in design. Maybe he could get a back issue or look for it online. If you would like to see some of the canes I have done go to the site and click on Ohio recip­i­ents. They are list­ed as by Jake Jacob­sen, Myron Jacob­sen and some are list­ed by Huber Heights senior carvers. Mine are done com­plete­ly by myself. They are the ones with a han­dle above the eagle head as I drill through them so they can be mount­ed on the shaft rather than as the cane han­dle. This URL will take you to the site where cane pic­tures are dis­played. I have pro­vid­ed canes more than 80+ canes I do not know the exact num­ber as I lost track. http://www.eaglecane.com/ftp.eaglecane/Recipients/Recipients.html When you get there click on Ohio. As it hap­pens, I have the Wood­Carv­ing Illus­trat­ed issue that Jake ref­er­ences. To make it eas­i­er for Mike to find WCI Issue 34, I took a pho­to of the cov­er and the first page of the arti­cle, so you could see the type of eagle described. 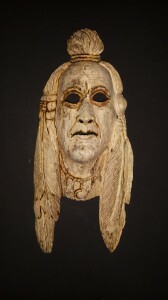 The arti­cle, Real­is­tic Eagle Bust, writ­ten by Pat Miku­la Moor, includes full carv­ing instruc­tions. Jake, that’s a ter­rif­ic sug­ges­tion for Mike, and you have my sin­cere thanks for all the canes you’ve carved for our vet­er­ans. Bless you. I received an email from Jan Omega out of Ontario, Cana­da. Jan has the great­est sense of humor. 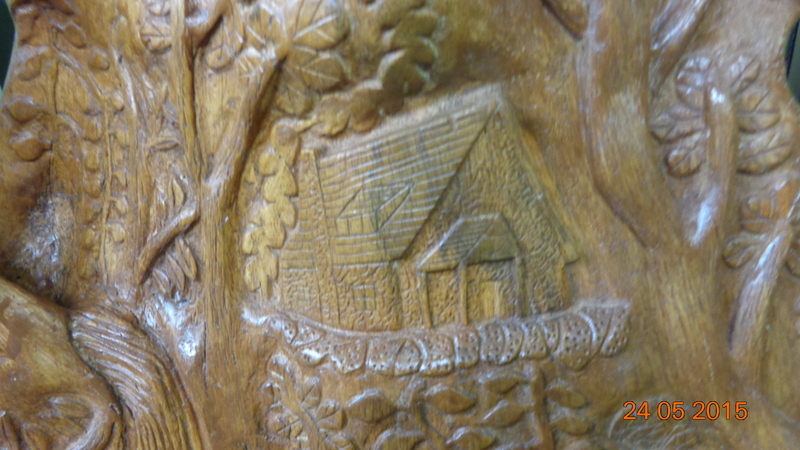 I met Jan and his wife once, over 8 years ago, and I still have a small cot­tage he carved. Here’s Jan’s TIP. As you well know I am NOT much of a read­er (lips get tired) but I read all of your let­ters. WELL DONE !! I DO spray “Endust ” on the fil­ters so all dust gets caught and once in a while I vac­u­um the fil­ters and because of the “ENDUST” it comes off easy. You have your self a great day now you hear. Two great TIPS from Jan – secur­ing fur­nace fil­ters on a fan, and then spray­ing them with Endust! While I can’t hang a fan from my drop ceil­ing, I thought this was such an inter­est­ing idea that I bought a box of fur­nace fil­ters and attached one to a fan with a bungee cord. Here’s a pic­ture of how it turned out. I still have to attach one to the back. It’s all about Carvers Help­ing Carvers! Technology — Can’t Live With It — Can’t Live Without It! Please refer and fol­low all man­u­fac­tur­ers’ direc­tions. The last week in Jan­u­ary, my inter­net access, per­son­al com­put­er, iPad, scan­ner, inkjet and laser print­ers got into an argu­ment and decid­ed not to com­mu­ni­cate with each oth­er. It was like a mas­sive divorce; they were all going their sep­a­rate ways. I spent over five hours cajol­ing, and then beg­ging them to acknowl­edge each oth­ers pres­ence. Yeah – right – you betcha. 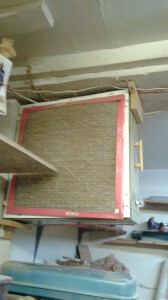 It was then that I men­tal­ly list­ed all the rea­sons I love carv­ing wood so much more than deal­ing with tech­nol­o­gy. You can carve any piece of wood, any­where in the world, with­out pass­words, inter­net access, pro­grams, inkjet or laser car­tridges, key codes, pro­gram upgrades, virus­es, virus pro­tec­tion pro­grams, scan­ners, down­loads, files, fold­ers, USB ports, dri­ver updates, clouds, back­ups, blue­tooth, and emails I should have, but I swear, nev­er received. It’s just you, the wood and a sharp tool. Heav­en! You wouldn’t believe it, to read the above, but I like tech­nol­o­gy, except when it doesn’t work NO MATTER WHAT YOU DO, and if I had won the MEGA-MILLION LOTTO I promise you, in a heart­beat, I would have drop kicked every last piece of tech­nol­o­gy I own out my sec­ond-sto­ry win­dow as soon as I checked that no one was in the back yard and would get hurt. And then … as usu­al … life proves how very wrong I am. Here it is – almost two weeks lat­er – and I am singing technology’s prais­es. Let me explain. I was speak­ing with Carv­ing Illustrated’s 2014 Wood­carv­er of the Year, (applause, applause) Rick Jensen, about bark pow­er carv­ing when Rick men­tioned that air fil­ters (because of dif­fer­ent man­u­fac­tur­ers) don’t always fit secure­ly into air clean­ers. While teach­ing one of his class­es, Rick noticed dust cling­ing to the wall behind the air clean­ers and decid­ed to inves­ti­gate. Rick then told me some­thing that I thought would be a ter­rif­ic TIP for this col­umn. It was Feb­ru­ary 11 when I called Rick to request his per­mis­sions to share his TIP (remem­ber the date – it’s impor­tant lat­er on). Not only did he allow me to share his TIP with you, he offered to pro­duce a short video for us! That evening, Rick asked his wife, Jody, (who just came home from a long day at work), to record his TIP, edit it, and send it to me via their Drop­box. I received the video, down­loaded the file to my Drop­box, and emailed the shared link to Matt Kel­ley, who will do his mag­ic so all of you can see Rick’s air fil­ter TIP, when you click the link below. Did I men­tion that I LOVE tech­nol­o­gy? 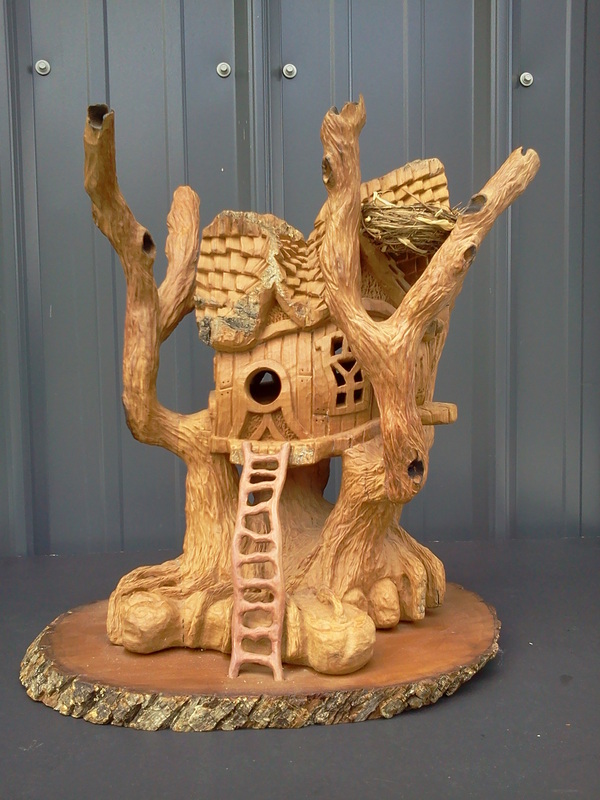 I always say that wood­carvers are the best peo­ple and it’s true. 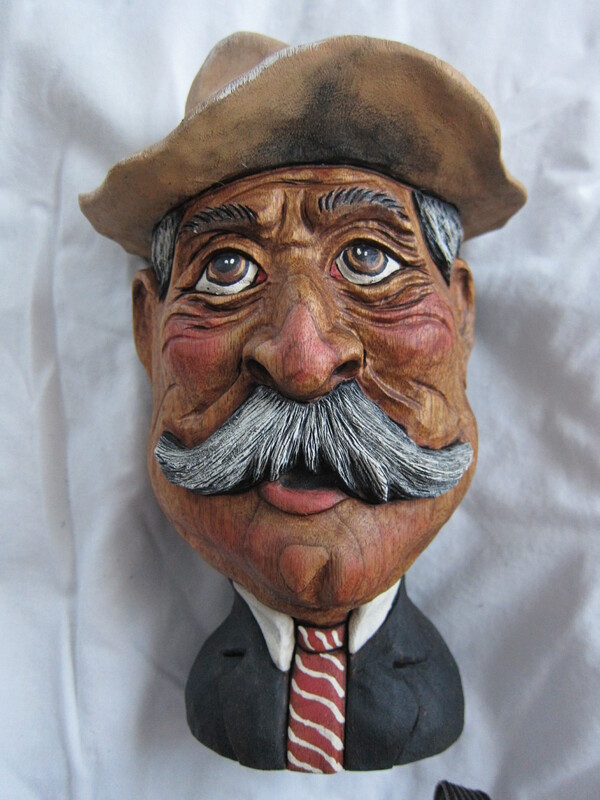 Now, I want to add that wood­carvers’ wives (and hus­bands) are just as great. Thank you, Jody, for tap­ing Rick’s TIP for all of us! On a side note … just for the heck of it … I checked the Inter­net and (I would nev­er lie to you) Mer­cury stopped going ret­ro­grade on Feb­ru­ary 11. I told you to remem­ber that date. Life is cer­tain­ly full of mys­ter­ies. Oh … one more thing … while I chat­ted with Rick, he men­tioned that he and Jody had just shot two videos for Sabu­ur­tooth Tools. You can see them at: https://www.facebook.com/saburrtoothtools/videos. Enjoy! Can you rec­om­mend any instruc­tion­al books, arti­cles, DVDs, etc. on the sub­ject of carv­ing car­i­ca­ture and real­is­tic human hands out there? Tips, advice, etc. would be appre­ci­at­ed. My carved hands either look like a knot of sausages or claws. The first thing I did when I received Gary’s email is trot down to my work­shop and dig through my study sticks. One of my favorites is from Dave Stet­son. Dave’s is the only hand study stick I have ever come across. I’ve owned it for years, and can’t recall where/when I pur­chased it. Because I think it is rather use­less to sug­gest an item to a carv­er with­out advis­ing where it can be pur­chased, I went online and searched and searched and searched and came up with nada. I made a few phone calls to ven­dors – still nada. Dave’s web­site, www.stetsoncarving.com didn’t offer the hand study stick either, so I called him – twice. But, there was no answer and no voice mail avail­able. Not to be deterred (work­ing hard for you, Gary), I emailed Dave. Dave called me right back and we had a great con­ver­sa­tion. Ends up that he had just pur­chased a new phone and hadn’t had time to set up his voice mail yet. Bot­tom line, we are in luck! 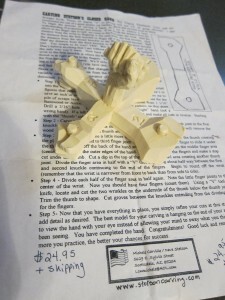 Dave no longer pro­duces these hand study sticks, but has about a dozen left. [Edi­tor note — make that eleven left.] 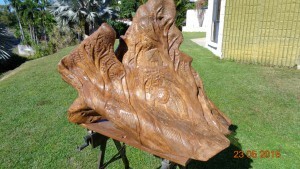 If you would like to pur­chase one, email Dave at www.stetsoncarving.com. They cost $24.95 plus ship­ping. When he sells the last of them — they’re gone. Before our con­ver­sa­tion end­ed, Dave asked if I had ever seen the Carvi­nOn­line web­site. I hadn’t, but after­wards I checked it out. It looks ter­rif­ic. There must be close to 20 accom­plished carv­ing instruc­tors offer­ing carv­ing videos. Their web­site is: http://www.carvinonline.com/index.shtml#What%20can%20I%20Learn. There is a cost per month, or for three months, or for the year to access the videos. What I liked was that there were a num­ber of free lessons offered by dif­fer­ent instruc­tors, so you can actu­al­ly take a test-dri­ve before you buy. 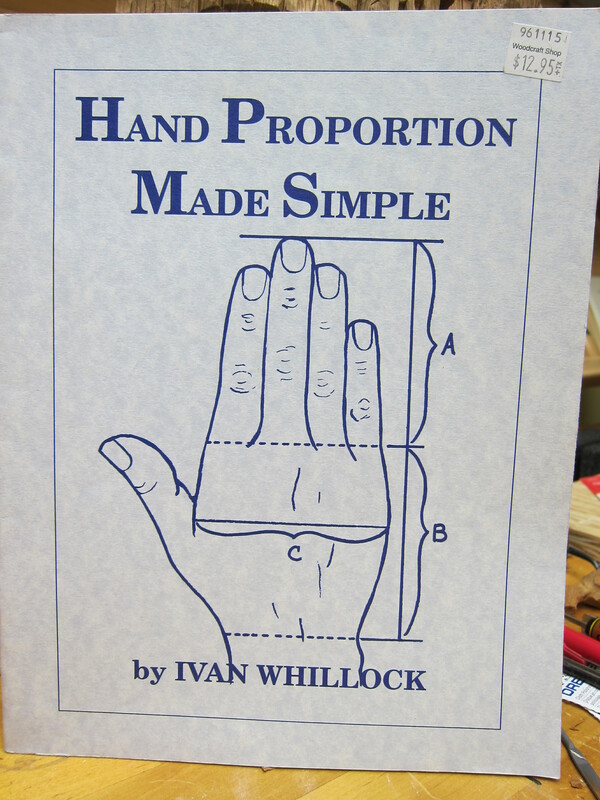 I did notice that there is one les­son offered on how to carve an opened hand. 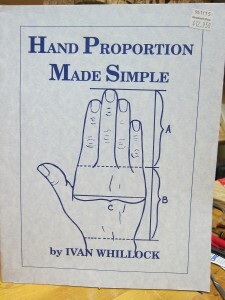 If you pre­fer to pur­chase a book on hand-carv­ing, then Ivan Whillock’s Hand Pro­por­tion Made Easy con­tains infor­ma­tion on carv­ing opened and closed hands as well as on the hand’s anato­my. This book is offered from our fine spon­sors. Thanks for your email, Gary. One of the rea­sons I enjoy writ­ing this col­umn is because I learn so very much when research­ing ques­tions like yours, as well as the oppor­tu­ni­ty to make new carv­ing friends like Dave Stet­son. 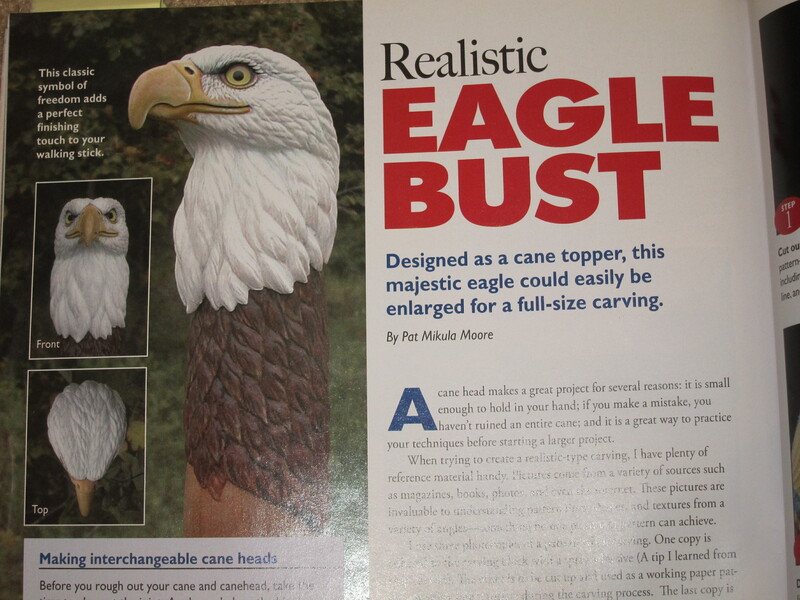 Hi Susan, I was won­der­ing where to find walk­ing stick how-to project of an eagle’s head. Ini­tial­ly, I respond­ed to Mike’s email with two book sug­ges­tions. The first book, should he want to carve a whim­si­cal eagle, is one I owned that uses bass­wood eggs, Carv­ing Wood­en Fin­ger Pup­pets and Cane Top­pers 20 Whim­si­cal Projects from Bass­wood Eggs by Ross Oar. 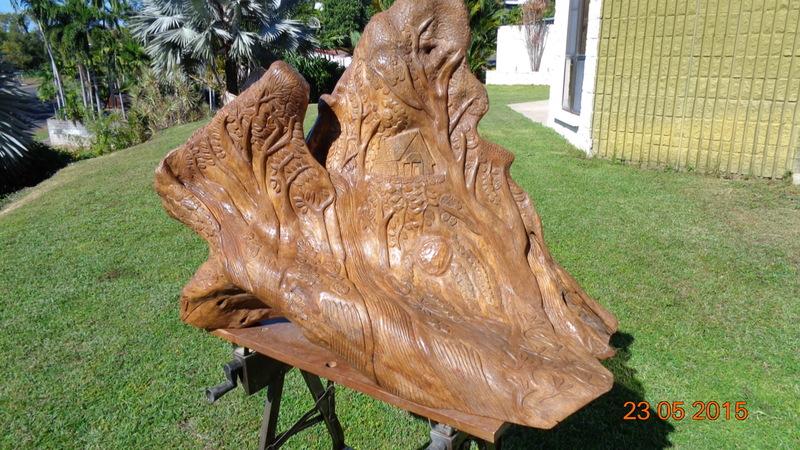 The premise is that you carve a hole in the back of your eagle head carv­ing which then allows you to either mount it on a cane, as a top­per, or place (not mount) it on a child’s fin­ger as a fin­ger pup­pet. I wasn’t cer­tain if Mike want­ed to carve a real­is­tic eagle, so I found a sec­ond book, online, Carv­ing Wild Fowl Canes and Walk­ing Sticks with Pow­er by Rus­sell, $14.95. I don’t have a pho­to of that, but there was an eagle on its cov­er. Since that time, I’ve been think­ing about Mike’s request. Per­haps, Mike want­ed to carve a walk­ing stick with an eagle’s head for a vet­er­an. If so, Hey Mike – here are two great links. If you go to: http://www.wcsh6.com/videos/life/2014/06/06/10069967/ you’ll see a news video about George and Don­na Gun­ning, along with Bert Tru­man, who have cre­at­ed over 1800 Eagle Canes. They’ll make an eagle’s head cane for any vet­er­an that requests one, free of charge. I had to share this with all of you. It makes me feel proud to be in the com­pa­ny of wood­carvers. Bless George, Don­na and Bert! Then, I found a sec­ond web­site, the Eagle Cane Project. This group’s goal is to pro­vide PRESENTATION CANES to a select group of Post 9–11 Vet­er­ans who have received some man­ner of leg dis­abil­i­ty from com­bat relat­ed actions. Their home page is: http://www.eaglecane.com/ftp.eaglecane/Welcome.html. Their site is very com­plete and well orga­nized. It offers Eagle Cane Project guide­lines, request form, poster, tuto­ri­als, and a list of par­tic­i­pants and orga­ni­za­tions, by state, with their emails, recip­i­ents, con­tacts, links and Eagle Cane News. It any read­er would like to offer addi­tion­al sug­ges­tions for Mike, please email me at SusanAlexanderCarvesOnWOM@comcast.net (or use the form at the bot­tom of this arti­cle) and I’ll list your sug­ges­tion and name in the next issue of WOM. Last month, I received an email from Jim Sul­li­van regard­ing pre­serv­ing wood carv­ing stat­ues. I haven’t received any respons­es from read­ers, so I’ll run this by you a sec­ond time, hop­ing some­one can offer a sug­ges­tion for Jim. Here’s the orig­i­nal email. 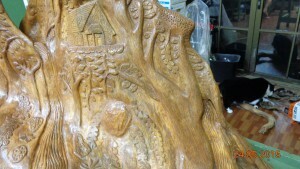 I own a nativ­i­ty scene crèche of sev­er­al carved wood­en fig­ures and a carved wood sta­ble. The crèche was pur­chased in Ober­amegau, Ger­many, in 1958. 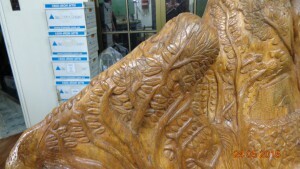 I think the carved wood sta­ble may be of arol­la (Swiss) pine, a type of white pine. 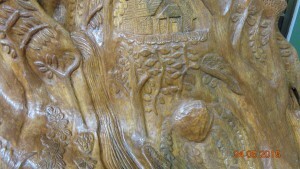 It is stained a medi­um brown and the carved fig­ures (prob­a­bly from a dif­fer­ent, close-grained wood) are unstained. What should be done to pre­serve the wood from dry­ing out or oth­er­wise improp­er­ly aging? Thank you. Last month, I also received an email from a carv­er who received a flex-shaft grinder/carver for Christ­mas. He asked for any Ref­er­ence Books or YouTube Videos that oth­er carvers can rec­om­mend for pow­er carv­ing. 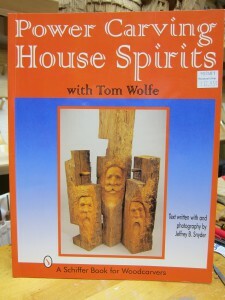 We can rec­om­mend, Pow­er Carv­ing House Spir­its by Tom Wolfe. It is avail­able from WOM’s carv­ing sup­ply spon­sors. If you have ques­tions for Susan, please sub­mit them using the form below. Do your wiz­ards, house and wood spir­its all have the same expres­sion on their face? Do they look as if they are relat­ed to each oth­er and have the same blood line, but not in a good way? Do you need some­thing to spark your imag­i­na­tion to find new and dif­fer­ent faces to carve? Oh do I have a TV Show for you! First, a caveat: I don’t watch scary movies. I don’t like scary movies, but for the last three years, I’ve been watch­ing Face Off on the SyFy Chan­nel sim­ply because I am amazed at how artists can cre­ate “char­ac­ters” which is exact­ly what we do when we carve faces. Face Off is a com­pe­ti­tion series that explores the work of spe­cial-effects make­up artists. 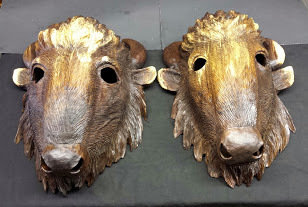 You can go to http://www.syfy.com/faceoff to see some of their work from past episodes, but it is best to watch full episodes (also avail­able on their web­site) because it takes you through the artists’ (the series begins with approx­i­mate­ly 10 dif­fer­ent artists) thought process­es, sketch­es, clay mod­els, col­or choic­es, wardrobes, and reviews. Admit­ted­ly, you prob­a­bly would not carve 90% of the crea­tures the artists cre­ate, but watch­ing the cre­ative process is mes­mer­iz­ing, espe­cial­ly when they decide to cre­ate “nature” crea­tures. 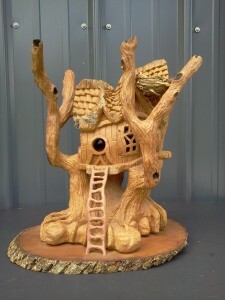 This is where our wood spir­its, house spir­its and wiz­ards appear – even a few gnomes and dwarfs. The judges, Ve Neill, Glenn Het­rick and Neville Page are spe­cial-effects mas­ters who have worked on movies such as Star Trek, Pirates of the Caribbean, Beetle­juice, Mrs. Doubt­fire (Ve Neill did Robin Williams’ make­up), Buffy, X-Files, The Amaz­ing Spi­der-Man, Plan­et of the Apes, The Incred­i­ble Hulk, The Lion, The Witch & The Wardrobe, and togeth­er have won Acad­e­my Awards and Emmys. When the judges point out the com­peti­tors’ errors, we are all giv­en the oppor­tu­ni­ty to learn from them. The judges also dis­cuss why cer­tain artists fail, which often includes bal­ance and pro­por­tion – some­thing we all use in our carv­ing. Take time to watch one Face Off episode. Don’t be turned off if they are doing zom­bies or skele­tons. Over­look the sub­ject mat­ter and lis­ten to the judges. We can all pick up a few point­ers, and you will def­i­nite­ly find new expres­sions for your carv­ings. Last month, I did a shout-out for fel­low carv­er, Rich Neely, who asked for tips, videos or books on carv­ing a female face. Short­ly there­after, the cav­al­ry (con­sist­ing of “Ol’ Don” Burgdorf and Don Mertz) arrived full of edu­ca­tion­al infor­ma­tion. I’ve down­loaded a few pic­tures so you have an idea of their offer­ings. I love Ol’ Don’s warn­ing.